Astonishing is the accelerated pace of which visual history is disappearing---the clock is ticking for rail historians to document the vestiges of the past because they are vanishing virtually overnight. 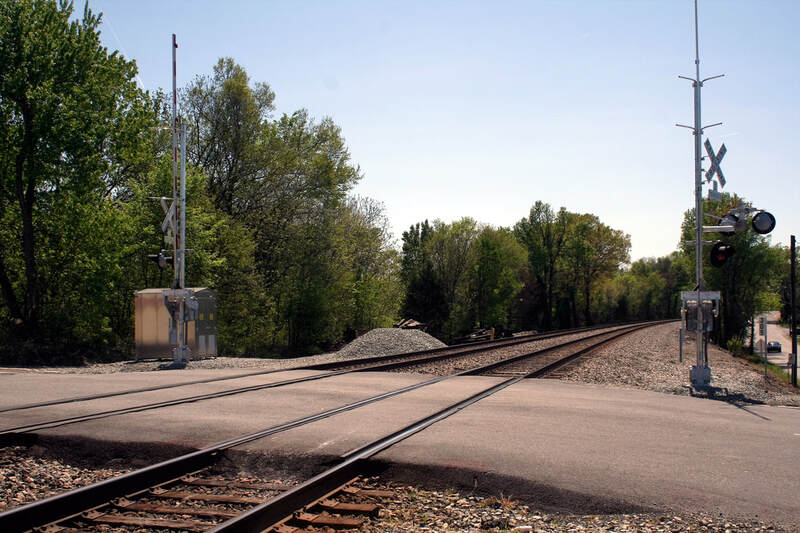 Signal replacements and the demolition of trackside structures, for example, continues at a rapid rate and a preponderance of rail trails emerge replacing the tracks and trains that once traversed them. Not only should this be taken into context with the big picture----such as the rail history of a large city or a specific route---but the small scale also. This piece is an example of exploration on the smaller scale. It examines Thomasville, NC, a mecca for the enthusiasts of modern day railfanning along the Norfolk Southern Washington-Atlanta main line. But that is a topic for another time as that scene is familiar in the annals of contemporary times. 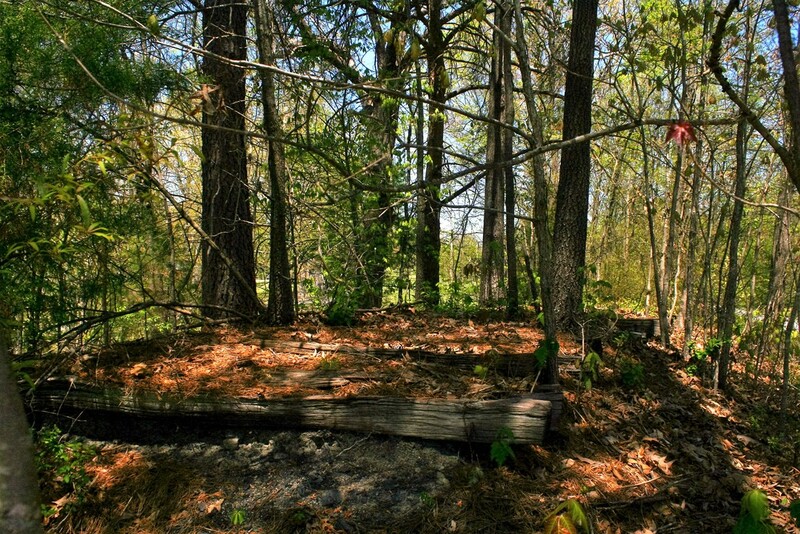 Rather, it is a peek at a long forgotten section of railroad remnants within the city once operated by the Southern Railway known as the Thomasville Belt Line. 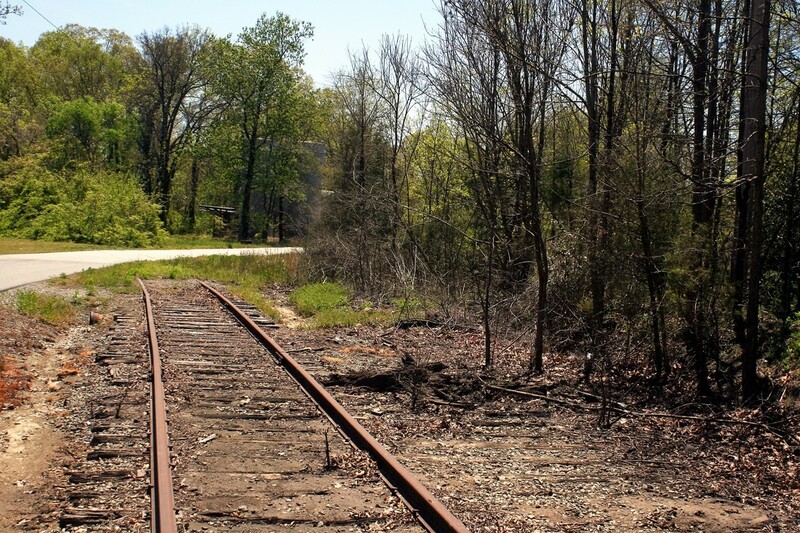 Included also are the abandoned remains of the High Point, Thomasville and Denton Railroad that operated within the parameter of the Belt Line. The largely forgotten railroad layout of inner Thomasville as it is and was. Two railroads operated within the industrial sector of town--the Southern Railway belt loop and the High Point, Thomasville and Denton Railroad. All of the shippers served by the two lines have vanished into history subsequently spelling their demise. The concept of belt line railroads began in earnest during the Industrial Revolution and specifically near the turn of the 20th century. Real estate along railroads as they were constructed through cities large and small was developed quickly but not exclusively with commercial shippers. As a result, future industry was forced to locate outside of city centers and the primary rail line(s)—typically, a main---facilitating the extension of rail service into these areas. 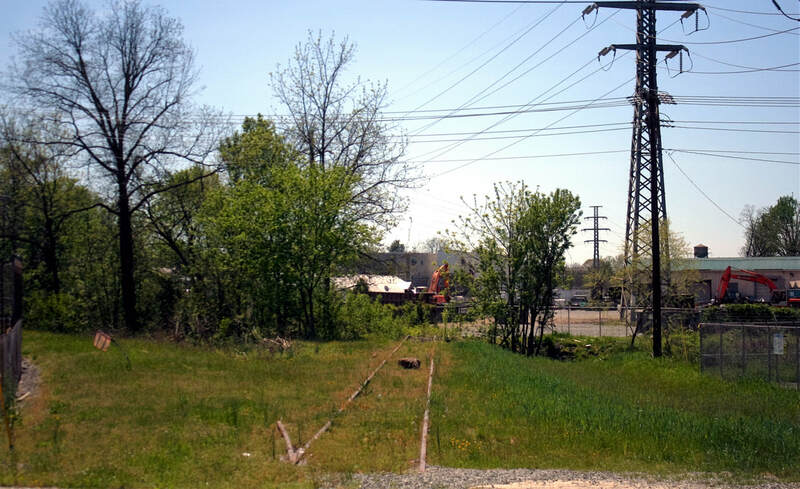 Depending on the extent of the industrial development, the railroad either constructed a spur to serve multiple shippers or more ideally, a belt line that connected to its main line at least two locations which improved service and simplified switching operations. Belt lines could either be owned by one railroad, perhaps more if multiple lines existed, or in other instances, independently owned and operated interchanging with the primary Class I roads. A 1913 cover sheet for a Sanborn map series of Thomasville. 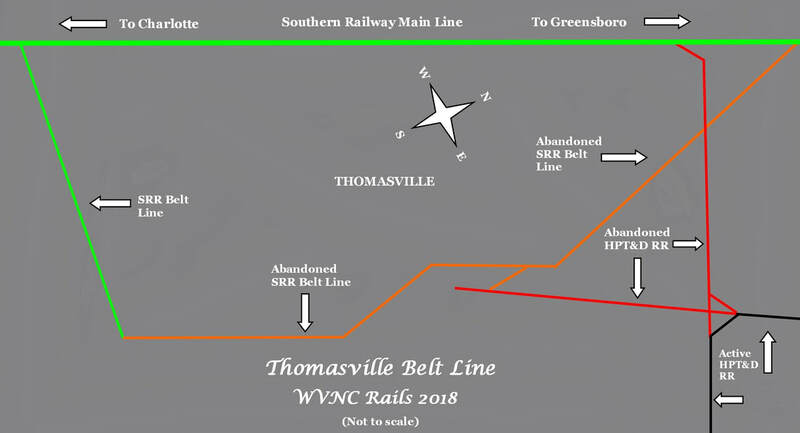 In addition to the Belt Line, the Carolina & Yadkin River Railroad (predecessor of the High Point, Thomasville, and Denton Railroad) and the Southern Railway main line are depicted. Left to right on this map is directional south to north. Uncounted people throughout the years perhaps have an unrealized connection to this small city in North Carolina. In fact, it is quite close to home--possibly inside it. The numbers of dining tables with a served meal and occupied chairs around them that were manufactured in Thomasville not only populate the homes of America but around the globe as well. For this city, along with neighboring Lexington and High Point, have been synonymous with the furniture industry for more than a century. As surveyors of the North Carolina Railroad passed through what is now present day Thomasville in 1851, its citizens began to eye the future with a vision of progress. The region, agrarian in nature as with most others, sought to expand agricultural commerce by way of farmers selling their crops to markets beyond the horizon. Four years later that vision became reality as the first train passed through Thomasville on a completed railroad between Greensboro and Charlotte. Preparations for the new railroad were well founded-construction of a downtown with a business district were concurrent with that of the railroad. Both a sawmill and grist mill were constructed along the right of way before the track was laid. Once trains were running, a hotel was erected to accommodate travelers and the spawning industry included both a lumber yard and brick plant. Curiously, a depot had not yet been constructed--in fact, it would be nearly twenty years later until a structure was built for that purpose. Within the next decade, the growth of Thomasville was interrupted by the onset of the Civil War. Except for the construction of a chewing gum factory, all other development was halted. The sons of Thomasville went off to war which not only decreased the population but thwarted the continued development of the town. As the cataclysm of conflict raged for four years, all effort was expended towards that means rather than the future in the aftermath. Fortunately, the town was spared the destruction of war--direct conflict avoided the area and Thomasville--aside from her sons that did not return--remained relatively unscathed. The North Carolina Railroad, however, was not as fortunate having sustained damage from the Union Army to disrupt a vital corridor through the Confederacy. The immediate years following the Civil War were spent rebuilding infrastructure and a general recovery as a whole. In 1871, the North Carolina Railroad embarked on a policy that continues to this day. 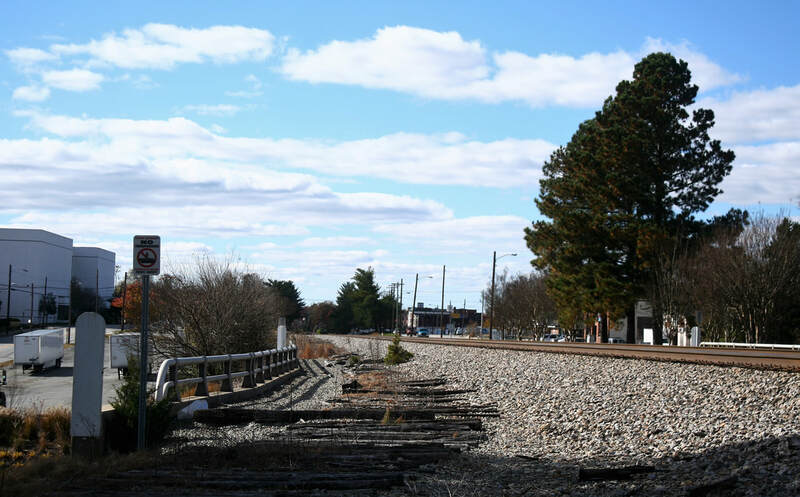 Although retaining ownership of the railroad which ultimately expanded to a 317 mile route from Morehead City to Charlotte, it is operated through a lease agreement. The Richmond and Danville Railroad--predecessor of the Southern Railway-- was the first to operate the line under this arrangement signing a 30 year lease as to which it would also provide the equipment. During the 1870s ground was also broken for the development of what would become the Thomasville Baptist Orphanage and the decade also marked the emergence of a new industry--shoe manufacturing. By the 1880s, Thomasville resumed its growth in earnest. With the Reconstruction era officially past and the recovery from war complete, the town diversified its economic development in conjunction with the shoe industry. 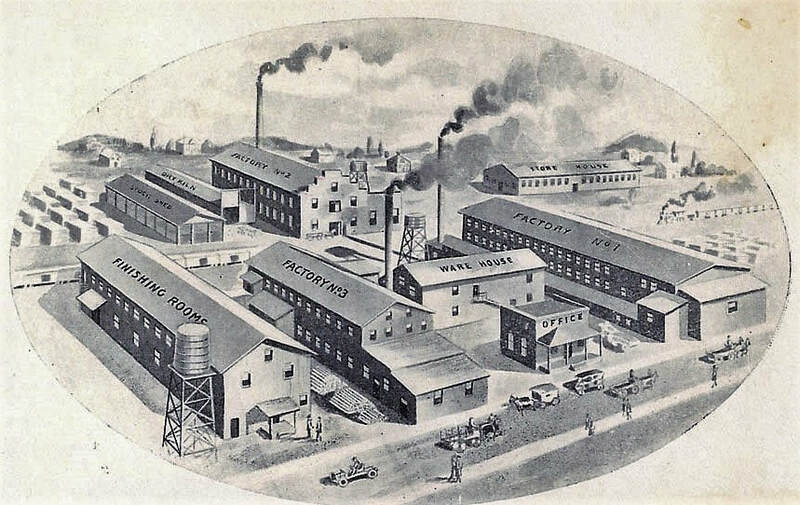 The addition of a smelter, stave factories, spoke and handle works, grist and roller mills expanded the commerce as well a notable entry that proved a precursor to the future of the town--a chair factory. In the making was a stage set for the dawning of both a new century and industry that became the hallmark of Thomasville. With the 20th century at the door step, large scale industry materialized with businesses of which numerous would survive deep into 1900s. Furniture makers such as the Standard Chair Company in 1898 and Climax Chair Company appeared the following year. The new century brought forth additional entries into the industry with the Cramer Furniture Company, Lambeth Furniture Company, Thompson Chair Company, Queen Chair, and in 1904, the Thomasville Chair Company. Adding to the spawning furniture business was the emergence of the largest industry throughout the North Carolina Piedmont region, textiles. 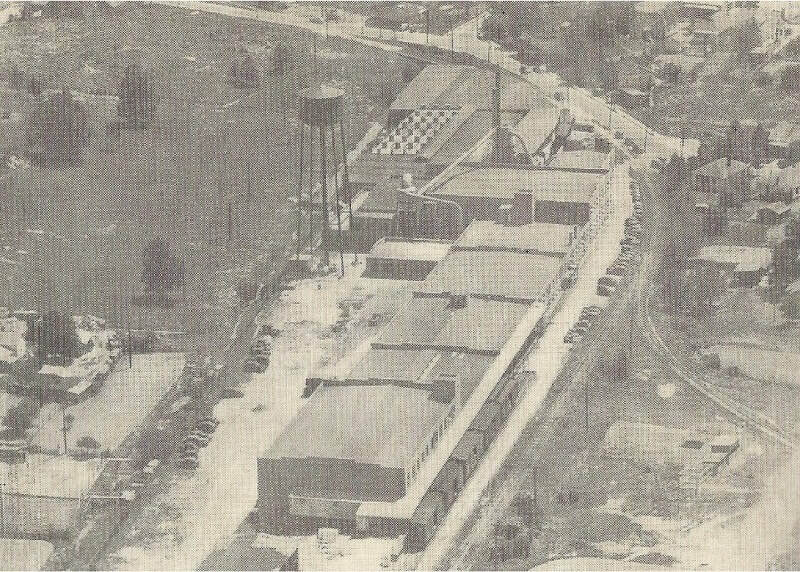 Jewel Mills began operation in 1909 and a year later, Amazon Mills joined it as the primary representatives of this business in Thomasville. Other independent merchants appeared such as the Peerless Packing Pad Company, Hinkle Milling, Glen Anna Mills, Bard Lumber Manufacturing, Thomasville Veneer and Panel Company, and the Columbia Panel Company. All of these businesses generated revenue for the railroads--most remained active deep into the 20th century by virtue of acquisition and/or merger. No piece about the Southern Railway belt line and supporting industry could be fulfilled without a historical recap about the Thomasville Chair Company. Simply put, this business dominated the 20th century industrial landscape of Thomasville thereby becoming the associated identity of the city. Moreover, so successful was the business that its brand name became known internationally. One of a number of small furniture enterprises that would populate the Thomasville landscape after the turn of the 20th century, the Thomasville Chair Company incorporated in 1904. Soon the company was in debt to a lumber company owned by T.J. and D.F. Finch who accepted company stock in lieu of cash. They commenced to purchase the remaining shares and set in motion the growth of the Thomasville Chair Company. Short was the time it took to not only separate the company from the competition but to begin acquiring it. The Thomasville Chair Company--later Thomasville Furniture Industries-- was the dominant industry in the city for nearly a century. Its name remains a metaphor for the furniture industry there. The wheels of growth began with the acquisition of the Bard Lumber Manufacturing Company in 1909 which became Thomasville Chair Company Plant B. In 1914, the Cramer Furniture Company was absorbed which immediately doubled the size of the company--this operation was christened as Plant C. The post World War I era focused on diversifying the company line of products. By 1927, the Thomasville Chair Company offered the broadest product line in the industry. The company also initiated automation assembly techniques which improved efficiency and productivity. A Depression era acquisition occurred when the company took over the Lambeth Furniture Company. The onset of World War II saw the company contribute to the war effort ---like multitudes of others-- by producing bunk beds, bomb plugs, and other necessary wooden wares. A 1941 industrial map listed five Thomasville Chair Company plants served by rail: Plant A (spur from Southern Railway main line) Plant B: (Southern Railway belt line) Plant C: (Southern Railway main and belt line) Plant D: (Southern Railway main line, belt line and HPT&D) and Plant E: (Southern Railway belt line) There appeared to be changes to spurs and services throughout the passing years as well. 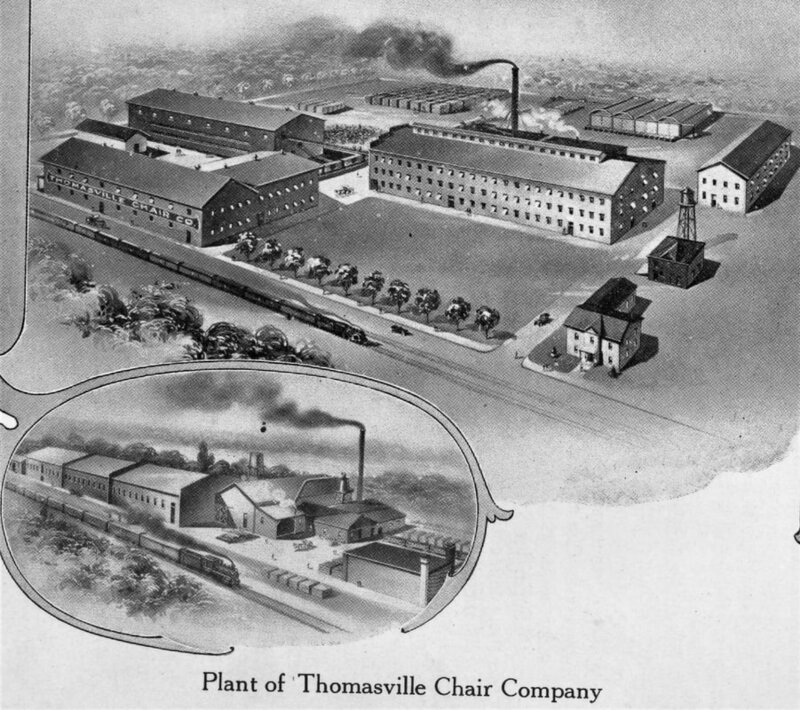 The Thomasville Chair Company boomed in the postwar years. Economic prosperity meant the construction of new homes which required new furniture to furnish them. This growth continued to what perhaps was the pinnacle during the 1960s--the decade that saw the merger (1961) with B. F. Huntley Furniture Company creating Thomasville Furniture Industries. Further acquisitions occurred into the 1970s and another growth spurt in the 1980s attributable to innovative advertising. The 1990s brought economic changes that adversely affected American industry and the furniture business was not immune. Foreign competition with products made at cheaper cost eroded domestic manufacturing resulting in mergers, downsizing, layoffs, and plant closures. 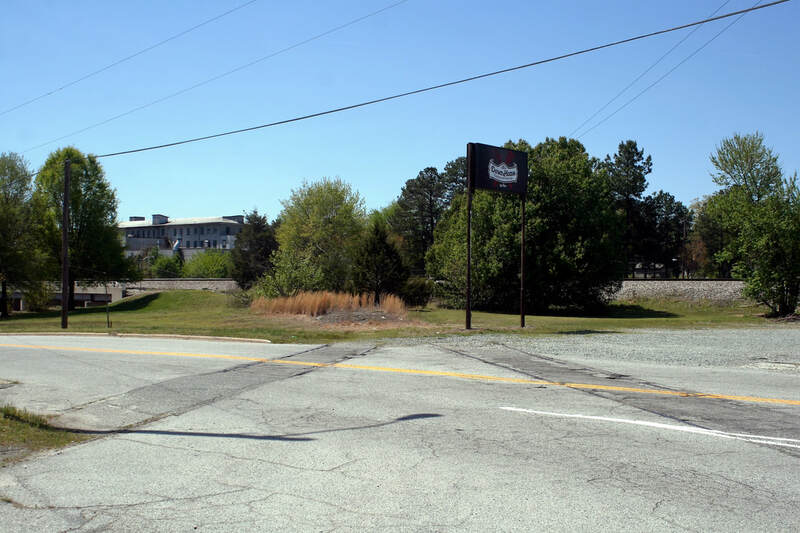 By 2014, all of the Thomasville plants had closed with production shifting overseas and even the Thomasville Furniture Industries name was buried within a series of mega mergers. As a footnote, the individual Thomasville Furniture Industries plants will be mentioned throughout the text with the 1961 pre-merger Thomasville Chair Company identification. This 2002 Google Earth snapshot provides a view of the south sector of the belt line. Shippers and spurs from the past are identified along the loop south of Fisher Ferry Road. Industrial pockets surrounded by residential neighborhoods define this region of the railroad. Beginning a tour of the belt line at its southern end offers a contrast to the remainder of the route for two reasons. 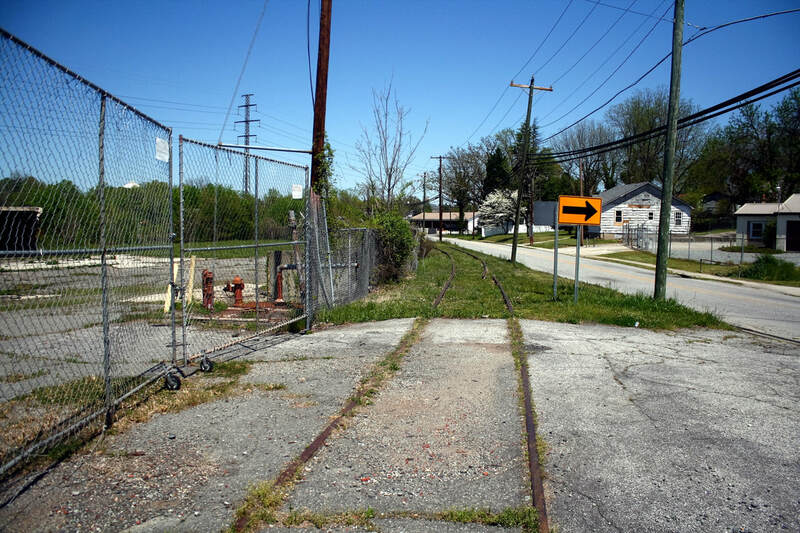 First, this section of the right of way is intact and for a half mile of its length, technically remains in use today by Norfolk Southern for car storage and maintenance of way use. The other difference is that there is no immediate indication that this line was industrial trackage; defined by a residential area and bordering the Thomasville Childrens Home (orphanage) campus, the setting is placid with a taste of the rustic. 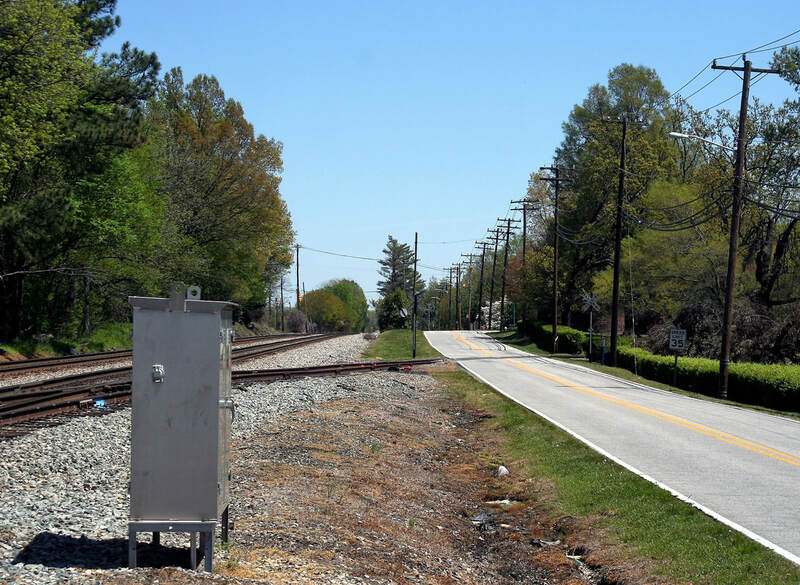 When the Southern Railway realized it was necessary to construct a belt line to serve the developing industry on the east side of Thomasville, it began acquiring right of way for the endeavor. One course of action necessary was the acquisition of right of way at a southern connection to the main line. 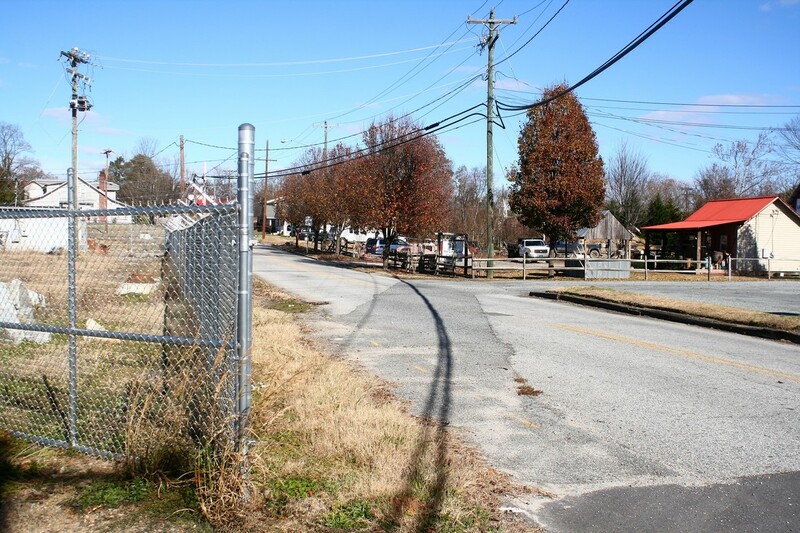 A survey determined that a feasible route would parallel Finch Avenue facilitating the use of property owned by the Thomasville Baptist Orphanage. Coincidentally, the orphanage sought a better means of transport for heating coal to the property. It had been practice to purchase coal in Thomasville and haul it by means of horse driven carts. Seeking a solution, the orphanage struck a deal with the Southern Railway that proved beneficial to both parties. In exchange for right of way through the property, the railroad agreed to construct a siding at the southeast end of the orphanage campus (Mills House) and deliver coal in hoppers. Additionally, the railroad was to maintain the siding and coal trestle and could not leave empty cars on the siding. Moreover, trains could not remain on the siding exceeding five minutes unless in the process of unloading (these provisions were obviously in the interest of safety for the children). The agreement was signed in 1907 and the following year, construction of the belt line and orphanage spur commenced. Beyond the orphanage spur remains, the belt line crosses Finch Avenue and turned north. This area begins the out of service section of the railroad and is bordered by woodlands and a residential area to the west. 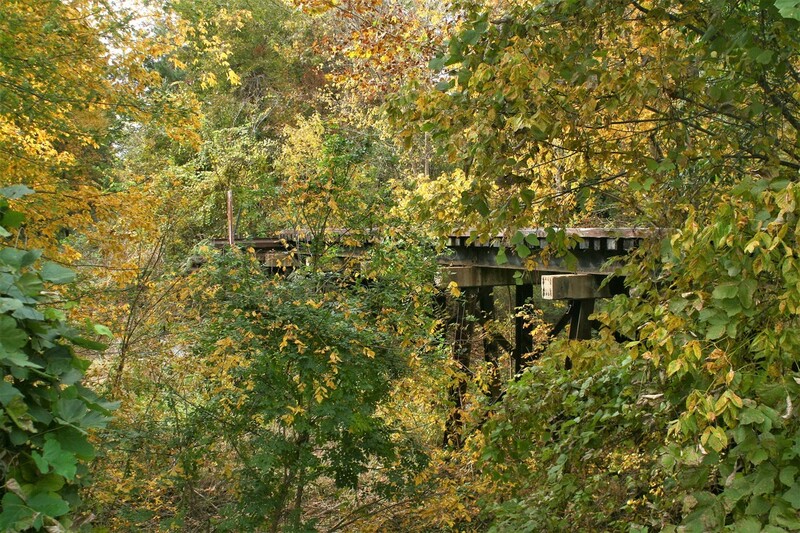 A trestle spans North Hamby Creek with the right of way paralleling its east bank. The track remains in place here but in dilapidated condition from years of non use. 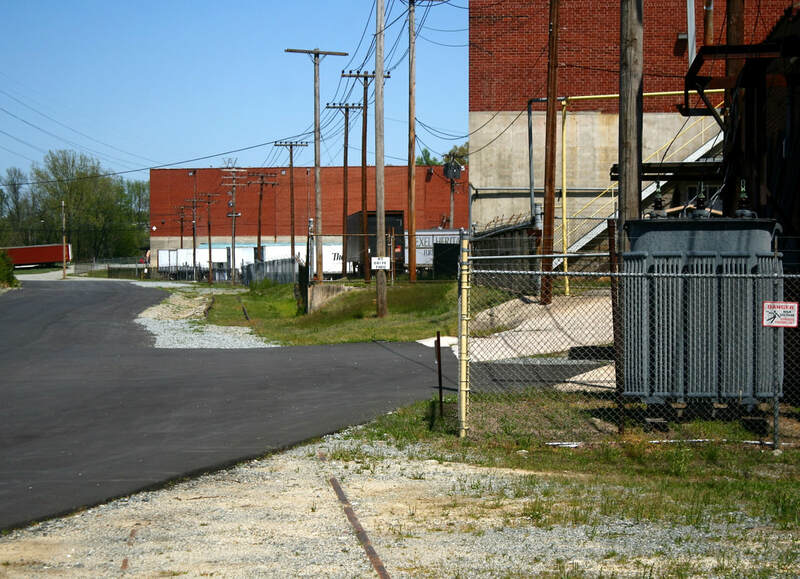 The area here at Amazon and Carmalt Streets is where the belt line began to resemble an industrial railroad. Along North Hamby Creek, vibrancy filled the air with the humming of business at shippers such as Amazon Mills, Peerless Packing Pad Company, and Thomasville Chair Company Plant B--the former Bard Lumber Manufacturing Company. Until three decades ago, the neighborhood was aplomb with activity but unfortunately, changing economic trends in conjunction with foreign imports adversely affected both the textile and furniture industries. Long before the Amazon merchant empire of today there was another Amazon--a cotton mill served by the Southern Railway belt line in Thomasville. 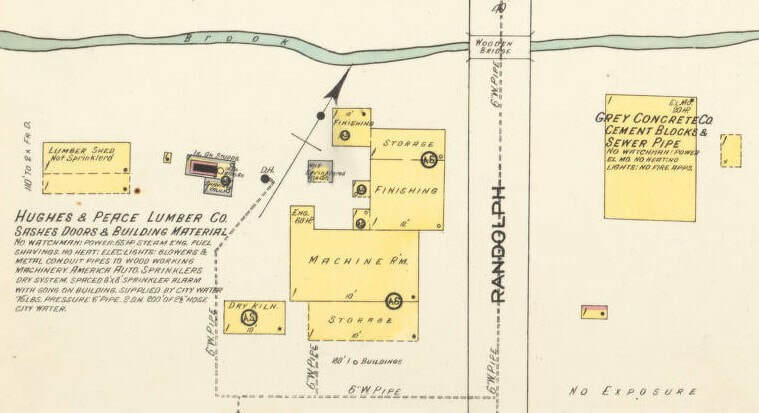 This Sanborn map depicts the plant and supporting structures as well as Peerless Packing Pad Company as they were in 1913. As the fledgling furniture industry gained prominence at the beginning of the 20th century, other businesses followed suit and emerged in conjunction with the industry. One such example was the establishment of the Peerless Packing Pad Company located on Amazon Street. It specialized in the manufacturing of packing pads for the shipment of furniture, fine china, and ironware. Machine made pads consisting of paper and excelsior--soft wood shavings--were produced and used by the area furniture industry. 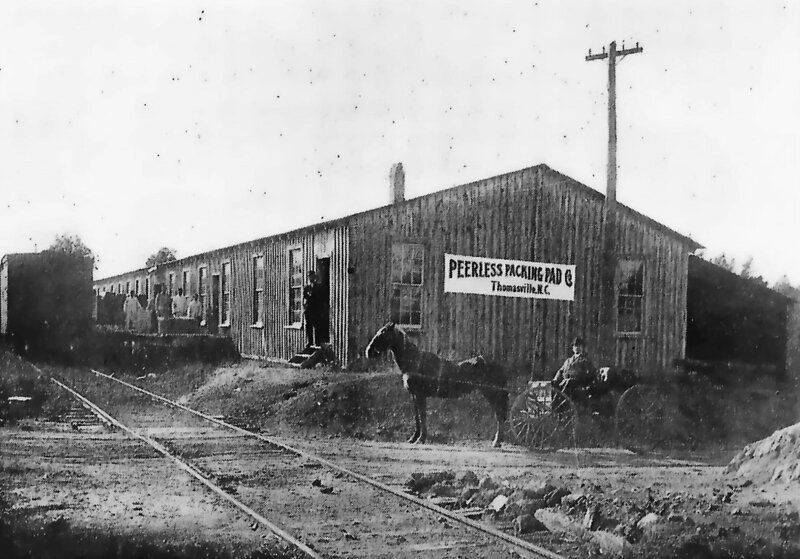 Peerless Packing Pad Company was served by the belt line and moving north along the route, it was the next shipper beyond the orphanage campus. 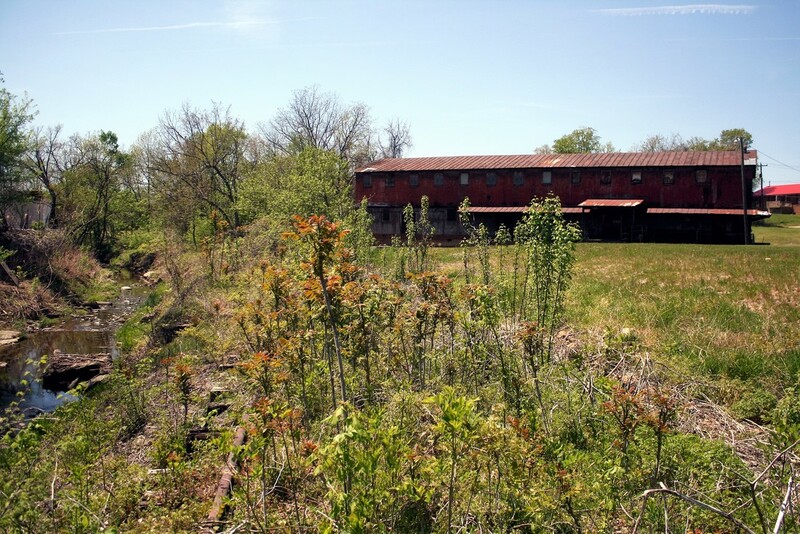 Located on the west side of the belt line adjacent to the Hamby Creek trestle, it was directly opposite Amazon Mills. A single spur received boxcars laden with paper and wood to manufacture the packing pads. This business, important as it was, disappeared early in the history of the belt line circa 1920s. 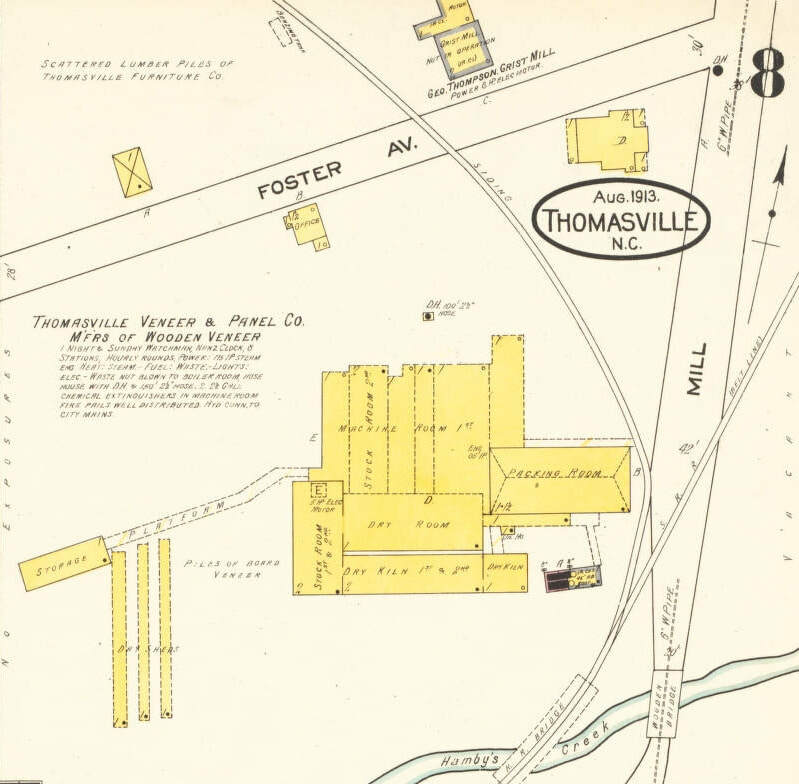 As a new century brought forth rapid development in the furniture manufacturing business, Thomasville also experienced the development of what became the signature industry in the North Carolina Piedmont region---textiles. Amazon Mills was one of two major cotton mills built in the town and became the largest shipper along the belt line not related to the furniture industry. It began operation in 1910 and subsequently grew in scope facilitating two expansions--the first in 1913 and again in 1924. 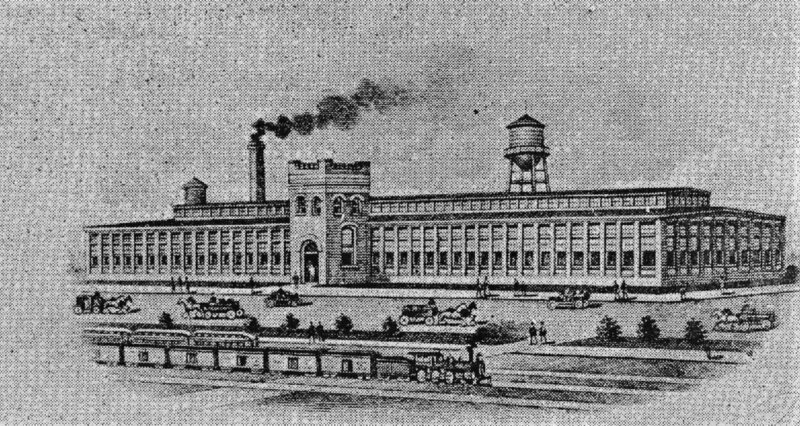 From its earliest years Amazon Mills was affiliated with the Cannon family empire of textile plants based in Concord and Kannapolis. 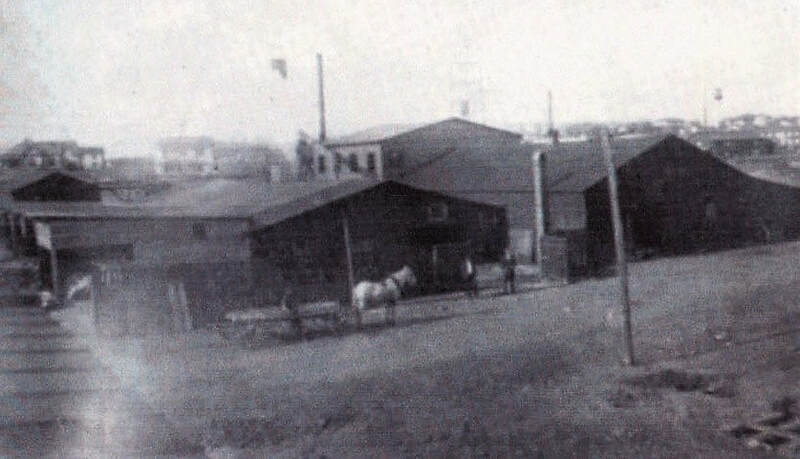 Amazon Mills as it was in its early years circa 1915. Subsequent expansions throughout the years enlarged the plant and altered the original appearance of the structure. A long time shipper in Thomasville, the building is now utilized by Parkdale Mills but no longer ships by rail. Image Davidson County Public Library/History of Thomasville 1902-1952. 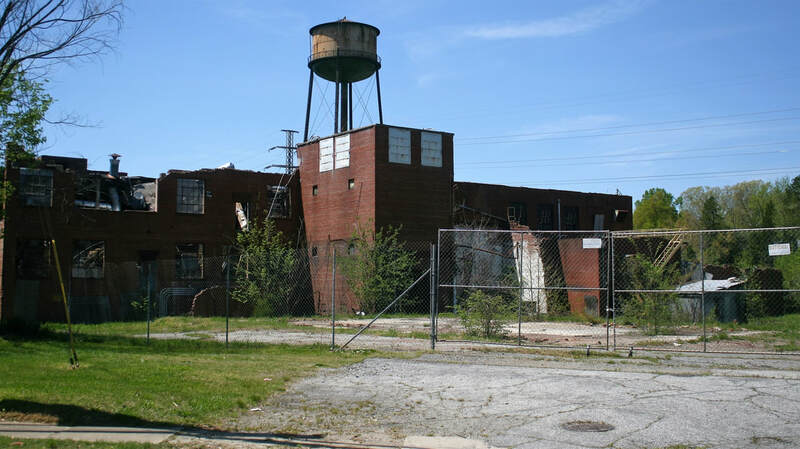 Amazon Mills remained a mainstay in the Thomasville economic fabric until the late 20th century when it encountered what the textile industry as a whole faced--foreign competition with cheap labor and detrimental trade agreements. This mill proved to be an exception to the prevailing rule, however. 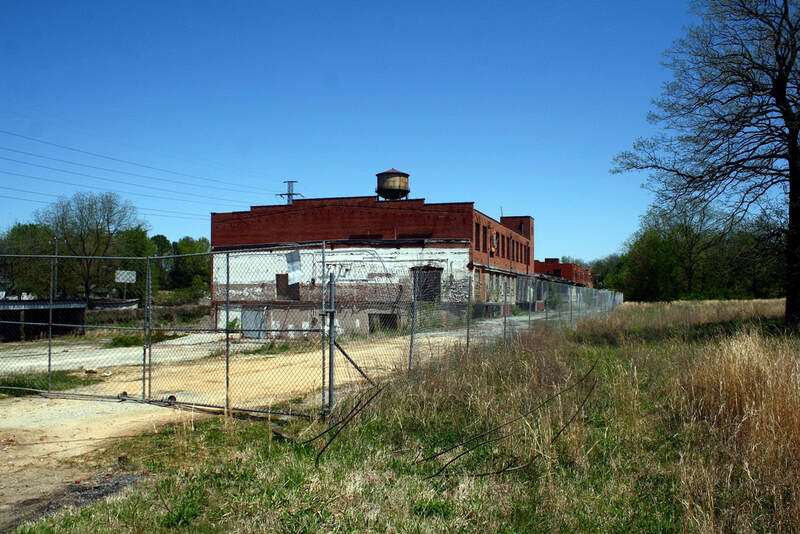 Instead of another empty industrial building on the Thomasville landscape, the former Amazon plant was spared when it was incorporated into the Parkdale Mills conglomeration and remains active today as its Plant #6. Rail service, however, is a distant memory. 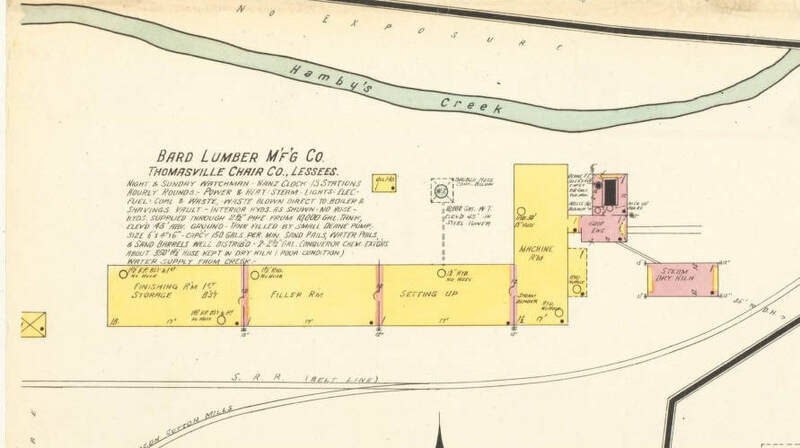 Situated on a tract of land adjacent to North Hamby Creek, the Bard Lumber Manufacturing plant began operation in 1907. 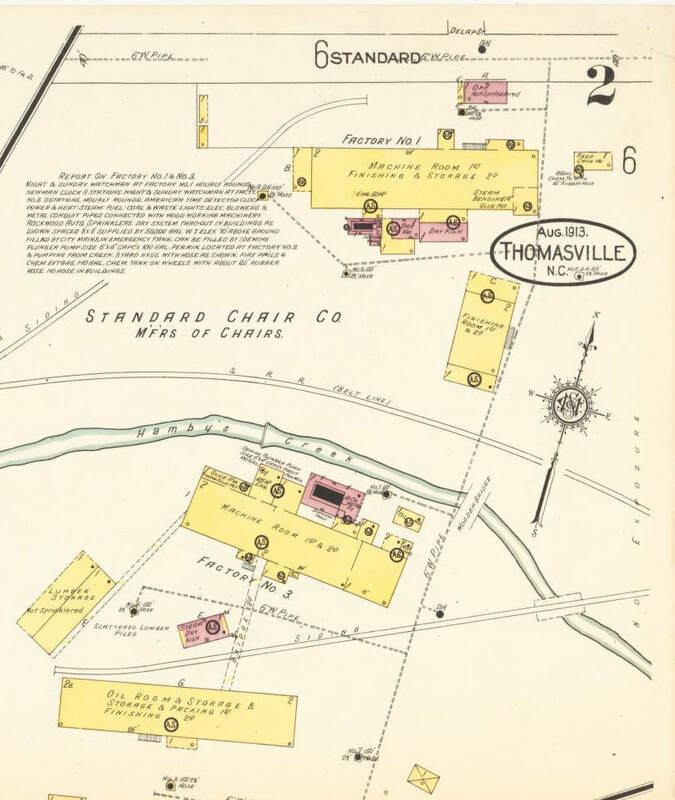 This 1913 map depicts the building after it was taken over by the Thomasville Chair Company. In terms of track layout, the area bordering the Thomasville Veneer and Panel Company was the most interesting in the belt line south sector. The belt line crossed North Hamby Creek and just beyond, a spur diverged toward the downtown area on Loftin Street. 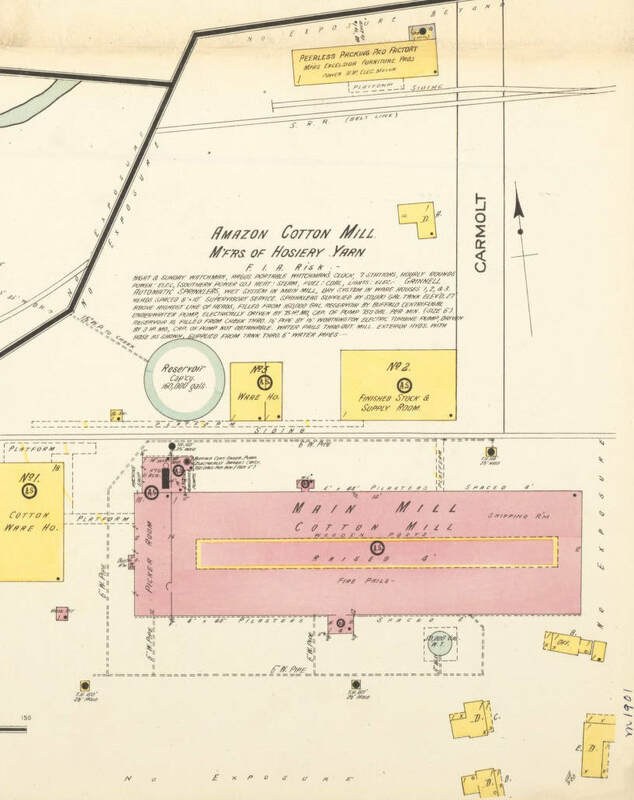 On this 1913 map, Fisher Ferry Road was known as Mill Avenue. Bard Lumber Manufacturing began as an independent business (1907) but was absorbed by the sprawling Thomasville Chair Company in 1909. Adjacent to it along North Hamby Creek was the Thomasville Veneer and Panel Company also constructed after the turn of the century. Both of these businesses were later incorporated as Thomasville Chair Company Plant B. The Veneer and Panel plant ceased operation first and was demolished or perhaps destroyed by fire. Research could not find exact details but the building had vanished prior to 1990. 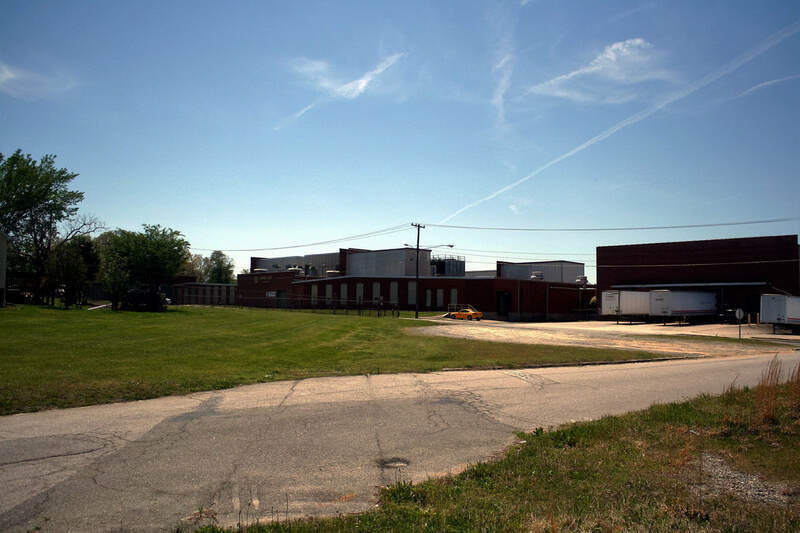 Thomasville Furniture Company records indicate the Bard Plant was closed by the new millennium and it was demolished September 2018. Exploring this area in early 2018 still presented the sense of an old industrial feel. The old Bard building stood in ruins housing the ghosts of activity long since stilled. Rusted belt line track remained between it and Fisher Ferry Road stimulating the imagination of Southern Railway switchers passing by with boxcars for the various industries. 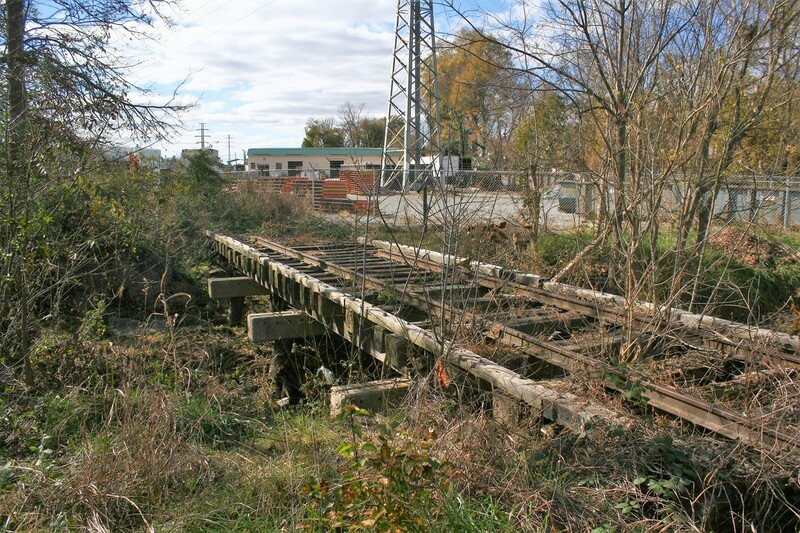 The trestle spanning the creek still stands with track intact but choked with growth. Shortly beyond it the rails are removed prior to what once was the Fisher Ferry Road grade crossing. Modern day exploration of the area along Fisher Ferry Road still offers telltale renderings from the past but they continue to vanish. North of the creek trestle, the belt line track is removed as the right of way is traceable where it crosses Fisher Ferry Road. 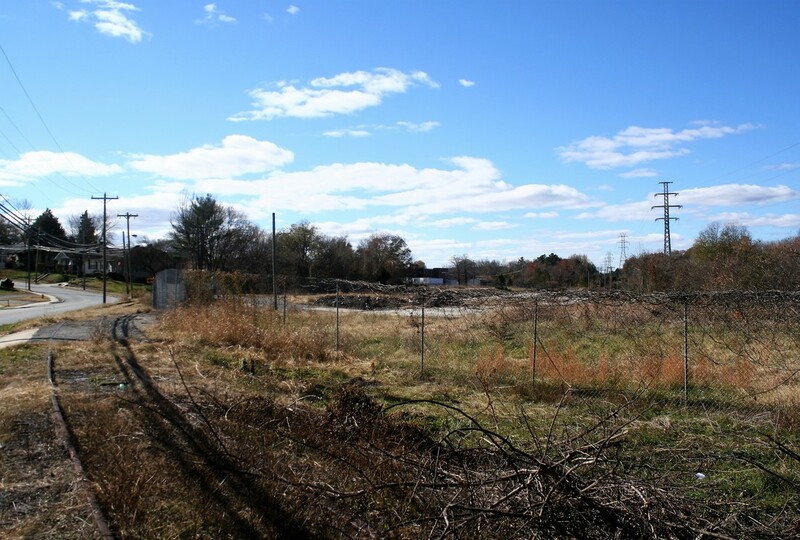 A large but fenced open field is the site of the long since demolished former Thomasville Veneer and Panel Company building. The only trace of the Loftin Street spur that once diverged from the belt line here are rails encased in the asphalt where it crossed Foster Street. Demolition of the old Bard Lumber building in September 2018 has further expanded the openness of an area that will be developed into a park. All traces of the rail and industrial past here may disappear as a result. Another of the large concerns to establish during the first decade of the 1900s was the Thomasville Furniture Company. It would remain in business as an independent firm for a half century operating at the intersection of Standard (Colonial) and Loftin Streets. Served by a spur from the Southern Railway belt line, it remained in business until going defunct in 1955. The Thomasville Chair Company acquired the property converting the manufacturing at the facility (Plant T) to that of making dining room tables and it remained in operation until around 1970. 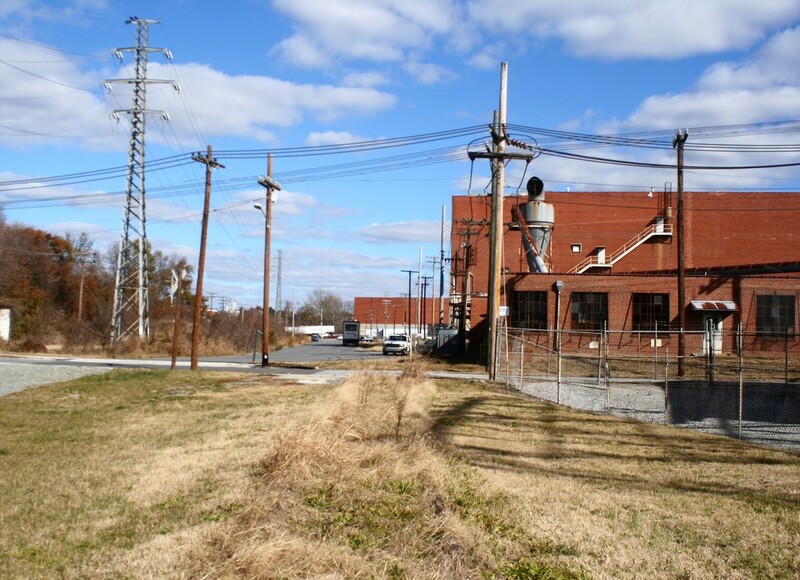 Demolished later in the decade, vacant lots exist where the plant once stood. One structure of the Columbia Panel Company still stands--the other was destroyed by fire in 1994. 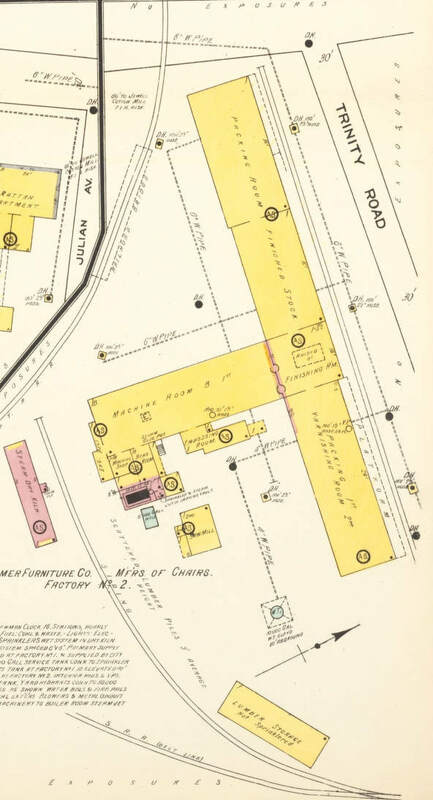 1913 Sanborn map of the Thomasville Furniture Company plant that existed on Loftin and Standard (now Colonial Avenue)) Streets. 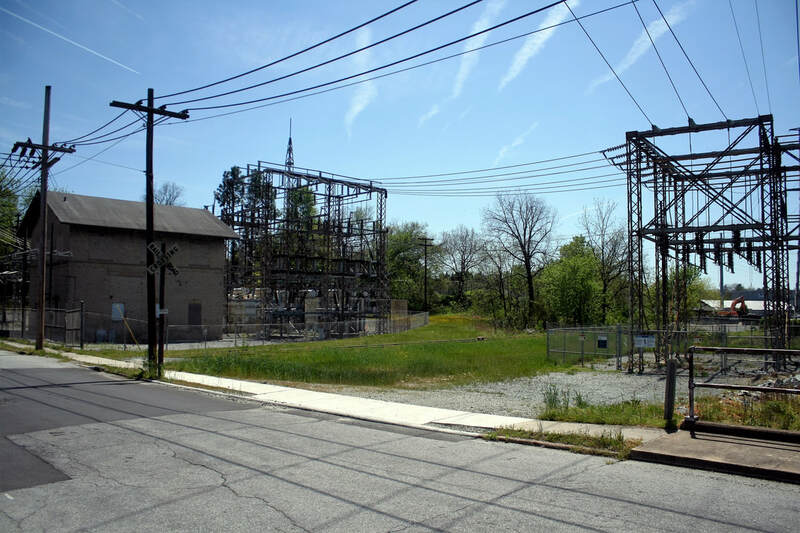 Two separated buildings that were connected by an overhead passageway and served by the rail spur that diverged at Fisher Ferry Road. Note that the Columbia Panel Company did not yet exist at this date. There is an air of mystique concerning railroad spurs that extend into the heart of cities traversing neighborhoods that are joint residential/commercial districts in nature. Residents could observe trains passing directly in front of their homes by either street trackage or the rails paralleling the road. From a safety standpoint, motorists needed a keen eye of awareness to avoid encountering a moving train in area where one was least expected. 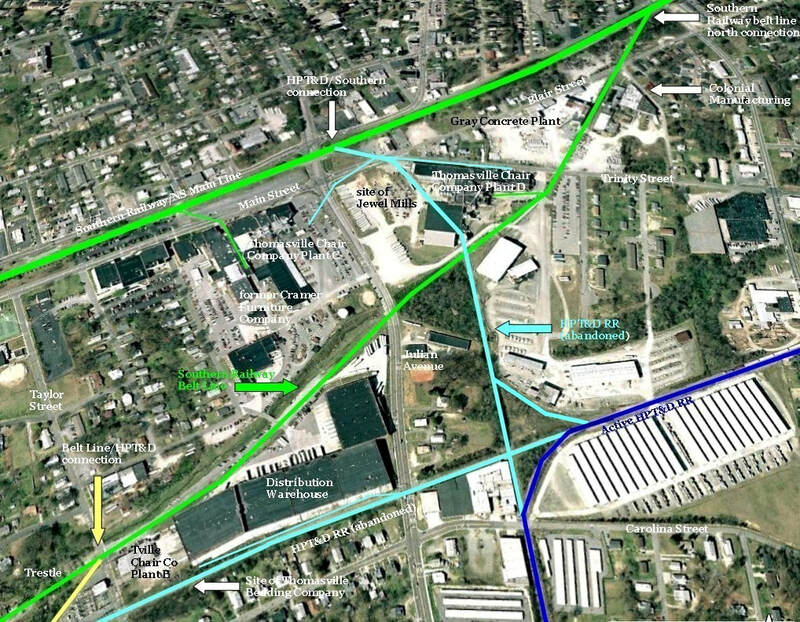 The spur that diverged from the belt line at the Thomasville Veneer and Panel plant at Fisher Ferry Road would qualify a such an example. 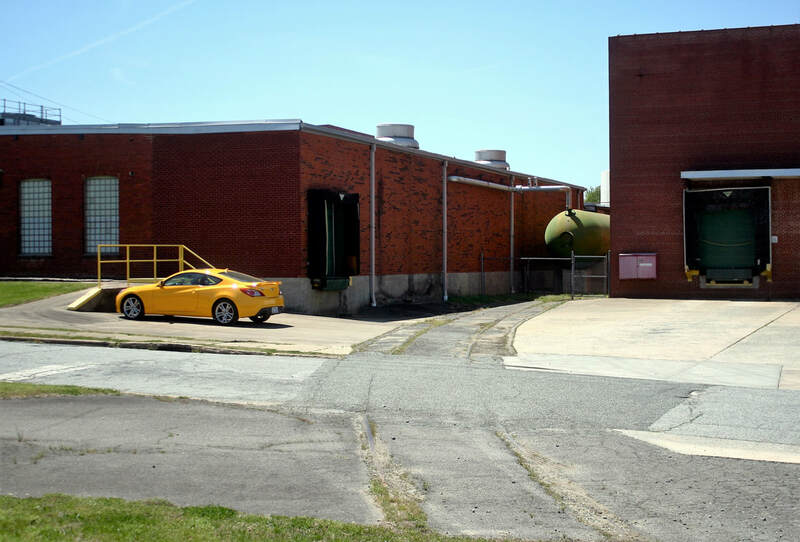 It passed through the plant property and discreetly crossed Foster Street whereupon it continued through a parking area before turning past the Thomasville Furniture Corporation plant. From here it crossed Colonial Drive paralleling Loftin Street past the second (yet connected) building of the Thomasville Furniture Company plant before dead-ending at the Columbia Panel Company. A 2002 Google Earth view centered on the mid section region of the belt line between Randolph Street and Julian Road. The map identifies businesses as they existed in 1941 and in addition to the route of Southern Railway Belt Line, the abandoned HPT&D Railroad right of way as well. 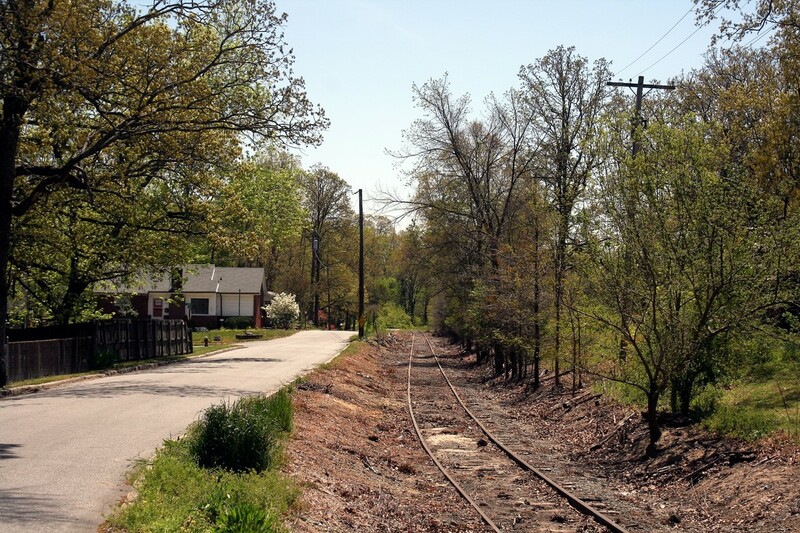 During the era of old time Thomasville, the region surrounding Randolph Street adjacent to North Hamby Creek developed as the heart of the Southern Railway belt line district. A second railroad, the High Point, Thomasville and Denton Railroad, factored into the scene here as well. The two railroads served the fringe of a business district that was continuing an eastward expansion that ultimately extended far past the original parameter. A visit in this area today is an amalgam of the old and new. 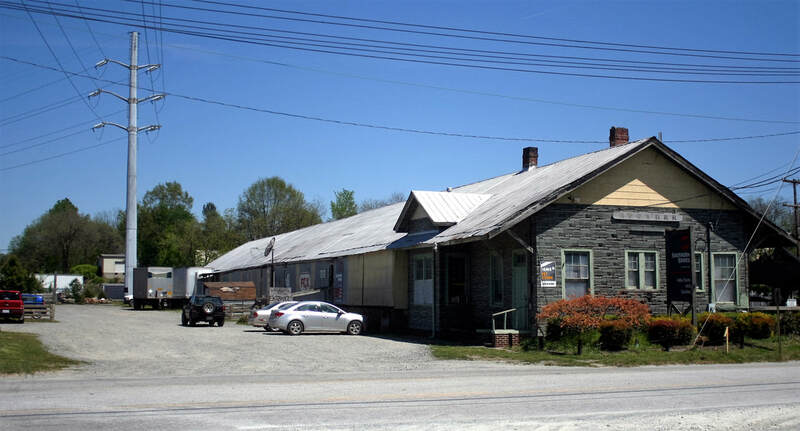 Whereas traces of the past remain--most notably, the former HPT&D depot--- interspersed is a contemporary Thomasville with modern businesses on a corridor connecting the city with Interstate 85. The heyday of this region was a cluster of firms that generated freight for both railroads. Randolph Street--bustling then just as it is today--was the artery of access to the industry and residential neighborhoods that populated the east side of Thomasville. Shippers that relied upon the railroads in this sector included the Standard Chair Company, Hinkle Milling Company, Gray Concrete and Pipe, and Hughes and Peace Lumber (later C.M. Wall and Son). The centerpiece in true railroad parlance was the HPT&D Railroad depot which served businesses without direct rail access. In all, it was a varied lot of shippers that kept trains moving in a sector teeming with activity. Sadly, no active railroad remains today as all of the long time businesses that relied upon it have passed into history. One shipper utilized rail service in modern times--Rinker Materials Hydro Conduit--but that, too, had ceased by the change of the millennium. Layout of the Standard Chair Company as it was in 1913. 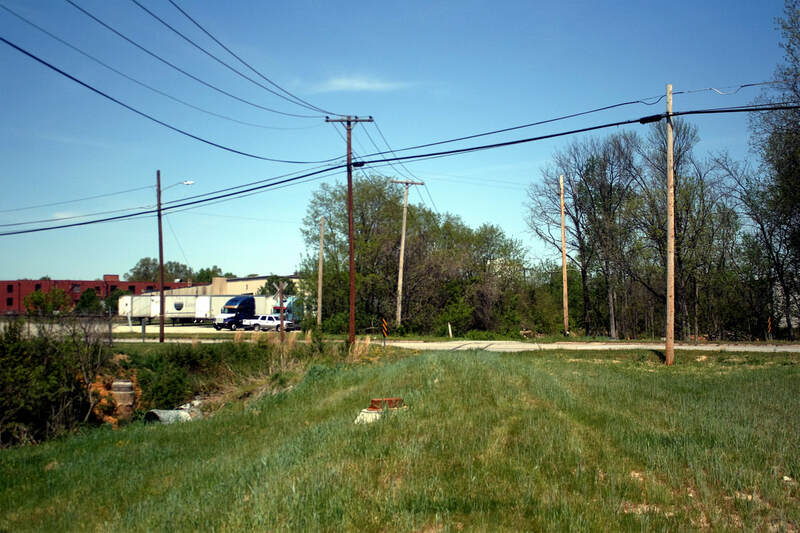 Flanking both sides of North Hamby Creek, each factory was served by a rail spur. Note that the spur to Factory #3 diverged from the belt line and crossed the creek on a small trestle. Standard Chair Company Factory #2 was located on Main Street and not served by rail. Established in 1898, the Standard Chair Company was among the earliest of the large furniture makers to set root in Thomasville. Within a decade, it had merged with Cates and Thompson Chair Companies creating a larger operating entity. Three factories were constructed flanking both sides of North Hamby Creek which each manufacturing a different line of chairs. Served from the Southern Railway belt line, two spurs were added with one crossing the creek on a small trestle. A spur from the HPT&D also served Factory #3. The plant received raw lumber and shipped out the finished products by rail. Notably, the Standard Chair Company survived until the 1960s as an independent company and held a distinction as one of few manufacturers not to disappear into the empire of the Thomasville Chair Company (Thomasville Furniture Industries). An exploration of this area is a revelation of the passage of time and progress in subsequent years. Little exists here today to remind one of this once formidable industry that stood along North Hamby Creek. One structure remains on the west bank of the creek (Colonial Avenue side) and the area once occupied by Factory #1--demolished during the early 1960s--is a vacant lot. A section of the belt line track still intact here is obscured by growth but no evidence remains of the spurs and trestle. Walking west along the creek towards Fisher Ferry Road revealed the section of belt line track ended just beyond the lone remaining structure. 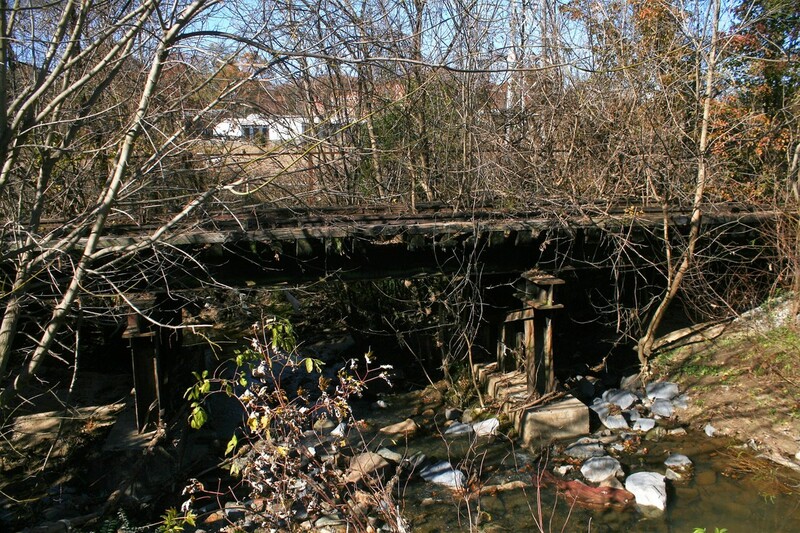 On the opposite side of the creek, the Factory #3 structures survived until they were razed in the early 2000s. 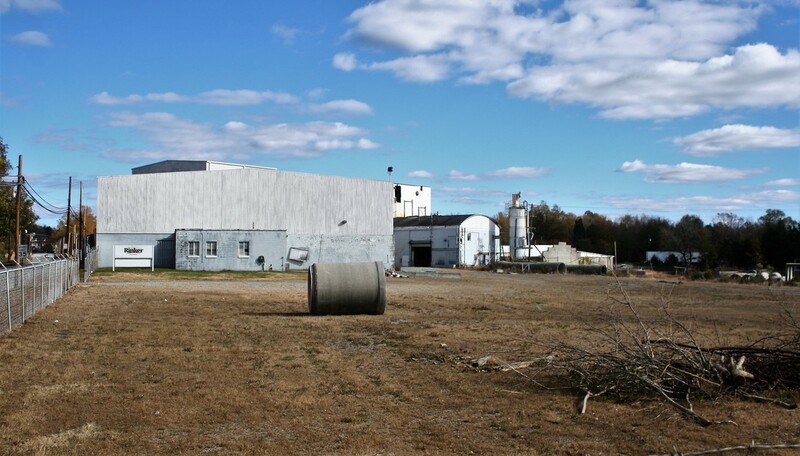 This property is now occupied by the Rinker Materials Hydro Conduit business. 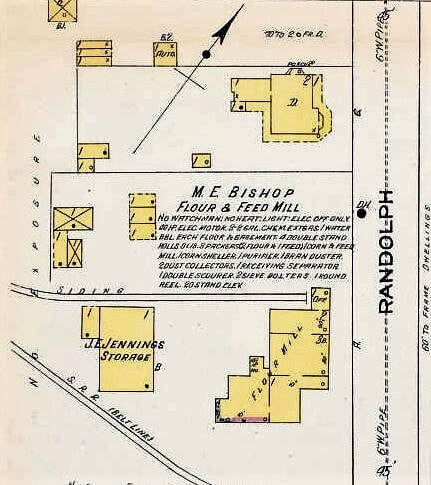 M.E Bishop Flour and Feed Mill as recorded on a 1913 Sanborn map. This business was the predecessor to the Hinkle Milling Company and from its earliest days was served by a spur from the Southern Railway belt line. In the annals of railroad industrial nostalgia, the feed mills served by rail rate high in charismatic appeal to your author. Childhood memories of these businesses with architecture as varied as any other rekindle a placid appeal. An old siding with either a boxcar or covered hopper, locals swapping stories, and the obligatory dog inside the building or asleep on the porch hearken to a bygone era. The Hinkle Milling Company ascribes the first two descriptions--perhaps a long time resident can answer about any dogs. 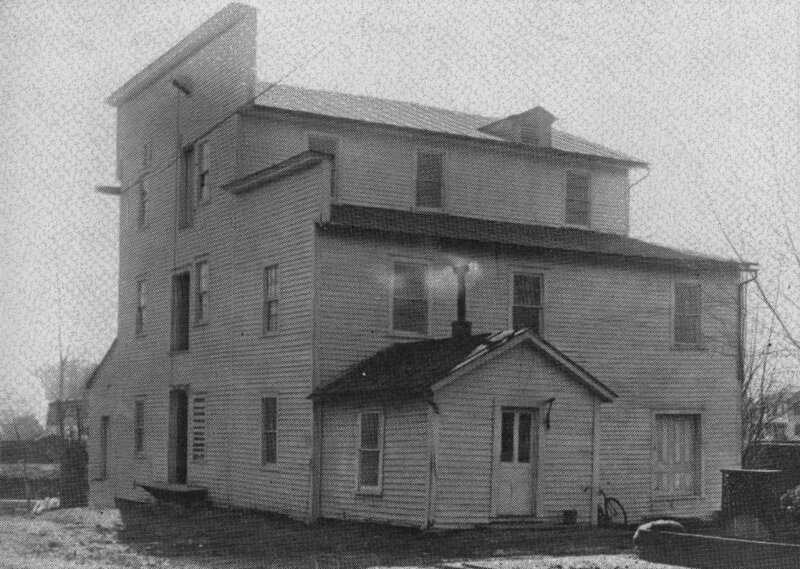 The Hinkle Milling Company as it appeared circa 1915. This small shipper expanded in later years and the structure received additions. A long time Thomasville landmark, it remained in business until 1989. Image Davidson County Library /History of Thomasville 1902-1952. 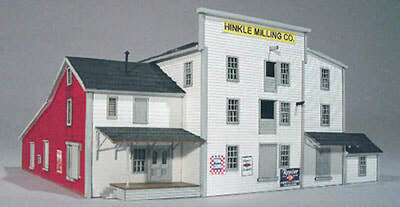 The prototype Hinkle Milling Company is gone forever but it can be reincarnated on N Scale model railroads. This kit by Fifer Models LLC was inspired by an article about the Thomasville structure in Model Railroad Craftsman magazine in 1982. Fifer Models photo. Opening for business in 1892 as the Eureka Roller Mill, this small industry on Randolph Road would change ownership numbering the fingers on the hand. The last of the brief owners, M.E. Bishop Flour and Feed Mill (aka Thomasville Roller Mills), was sold in 1914 and became the Hinkle Milling Company. All told, the combination would serve the farming needs of Thomasville for a century through times both boom and bust. The mill became an institutional landmark on the east side of Thomasville. 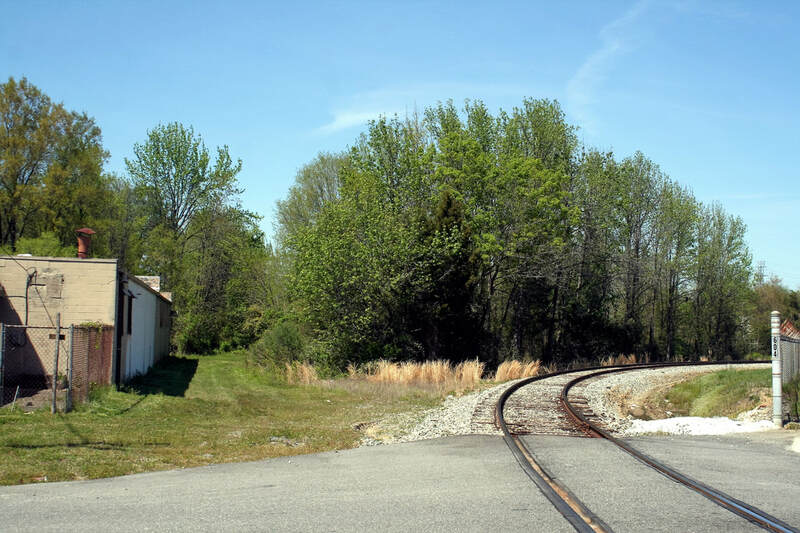 Throughout its existence, it remained a rail shipper served by a spur from the belt line that diverged north of the Standard Chair Company beside North Hamby Creek. As business increased, it was necessary to expand capacity which resulted in additions to the original structure. Operational output of the mill peaked during the 1950s but the following decade proved the harbinger of change on the horizon. Demand decreased for products and by the 1970s, operations reduced in scale. Hinkle Milling remained in business for another two decades until ceasing activity in 1989. There was hope for preserving the structure but such a prospect proved too high a cost for feasibility. Unfortunately, it was demolished in 1992 and modern businesses now occupy the real estate. Hinkle Milling, however, lives on in the world of N scale model railroading--Fifer Models released a craftsman kit which is an exact replica of the building. The Hughes and Peace Lumber Company (later C.W. Wall and Son) and the Gray Concrete Company as they were in 1913. Gray Concrete also occupied the opposite side of Randolph Street but perhaps not yet at this date. HPT&D spurs crossed the street from the depot and although not indicated on this map, assuredly served these two businesses. Gray Concrete and Pipe Company was a long time rail shipper in Thomasville that began business during the early 20th century. 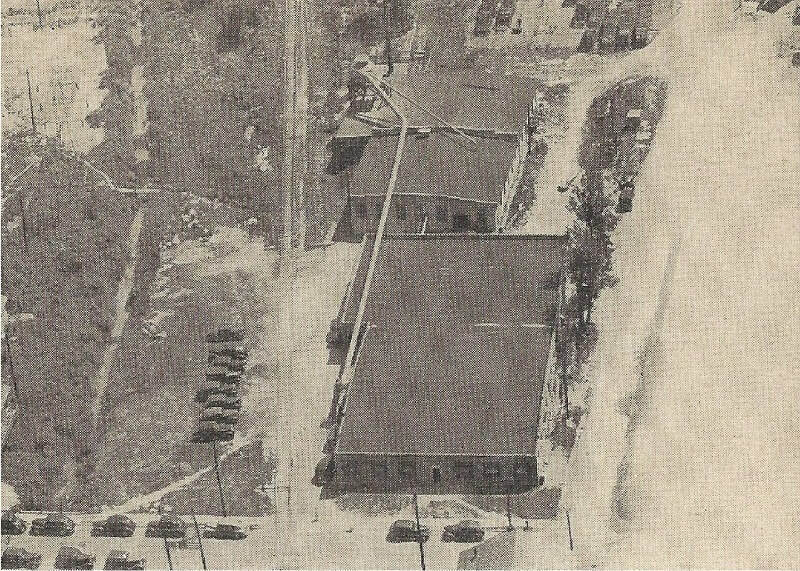 A first facility was constructed on the north side of Randolph Street and eventually property was acquired to expand to the opposite side across from the HPT&D depot. A spur extending across Randolph Street from the depot served the facility at that location. 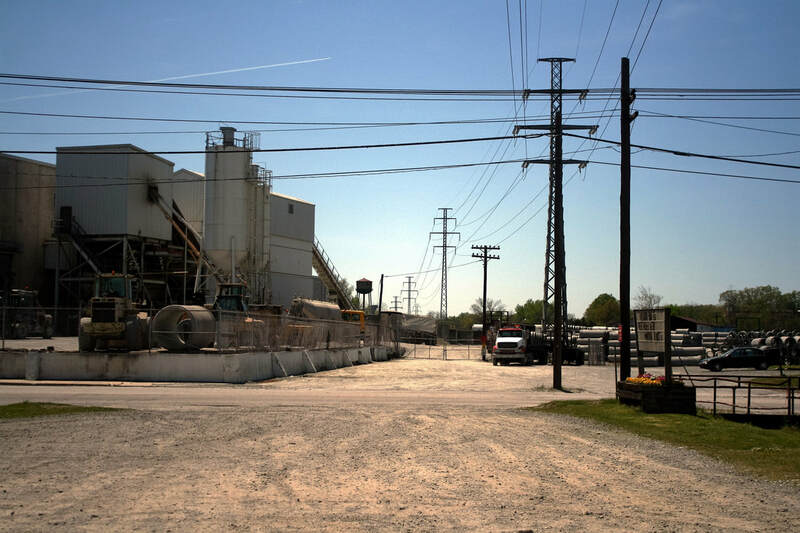 Yet another Gray Concrete plant existed at the north end of town on Blair Street adjacent to the Southern Railway belt line and near its north junction to the main line. During the 1980s, Gray Concrete was acquired by Rinker Materials Hydro Conduit and this business expanded on real estate once occupied by the Standard Chair Company and C.M Wall & Son. A family owned proprietorship from the late 1800s-early 1900s generally remained in business until acquired by another firm or a death resulting in the sale or closure of the merchant. The lumber business that developed on Randolph Street is an example of the latter. Near the turn of the century, Hughes and Peace Lumber Company constructed a lumber yard that remained active until the 1913 death of A. W. Hughes. The company then passed to Jennings Manufacturing Company and operated under that ownership manufacturing box shooks until 1924 when C.M. Wall & Son, a Lexington based business, purchased the stock. 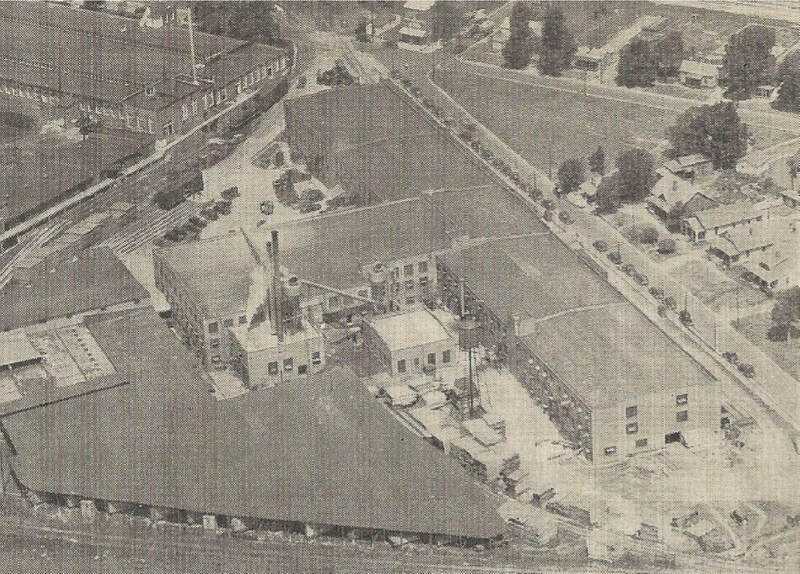 C. M. Wall & Son continued the box shook production operating the Thomasville plant as a branch. A spur also crossed Randolph Street from the depot to the vicinity of this firm which in all likelihood utilized rail service. The wooden box shook business declined precipitously after World War II with the development of quality and cost effective corrugated cardboard boxes. Since the High Point, Thomasville, and Denton Railroad (HPT&D) co-existed with the Southern Railway belt line serving the Thomasville industrial district, it is appropriate to include a brief background on this small carrier. 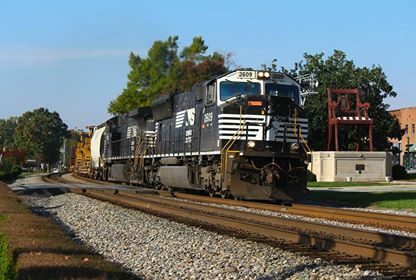 The railroad operates to this day--it has been controlled by the Winston Salem Southbound Railway (WSSB) since 1961 and recently, formally merged into the WSSB which in turn, is jointly owned and operated by CSX and Norfolk Southern. Although the HPT&D and WSSB are operated as one, they "retain" their individual identities both by employees and the rail enthusiast/historian communities. The lineage of the HPT&D began with the original charter of the route operated by the Carolina, Glen Anna and Pee Dee Railroad which was a logging line. Short in length, it operated from Thomasville for a few miles to the south. In 1906, $100,000 was authorized by the High Point City Council to extend the railroad from Thomasville to High Point. 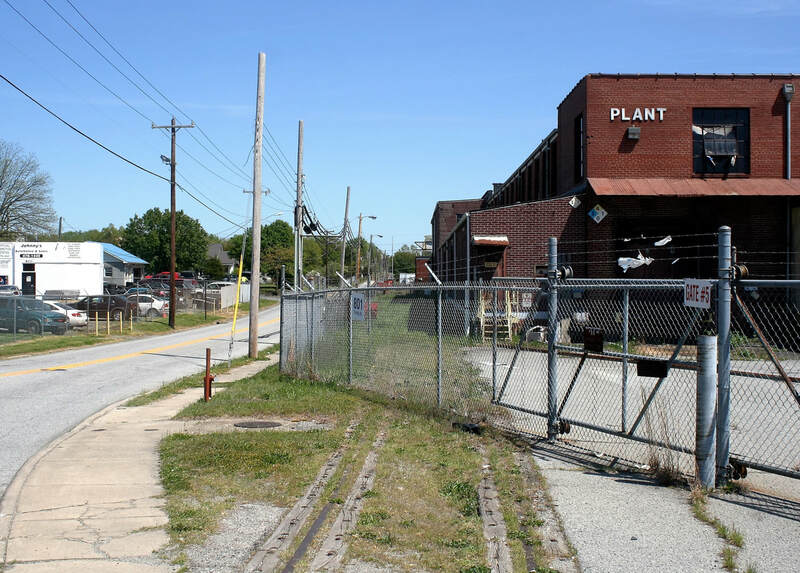 The projected goal was to connect the route with the Seaboard Air Line at Wadesboro and the Norfolk and Western at Winston Salem as an alternative to a Southern Railway monopoly. 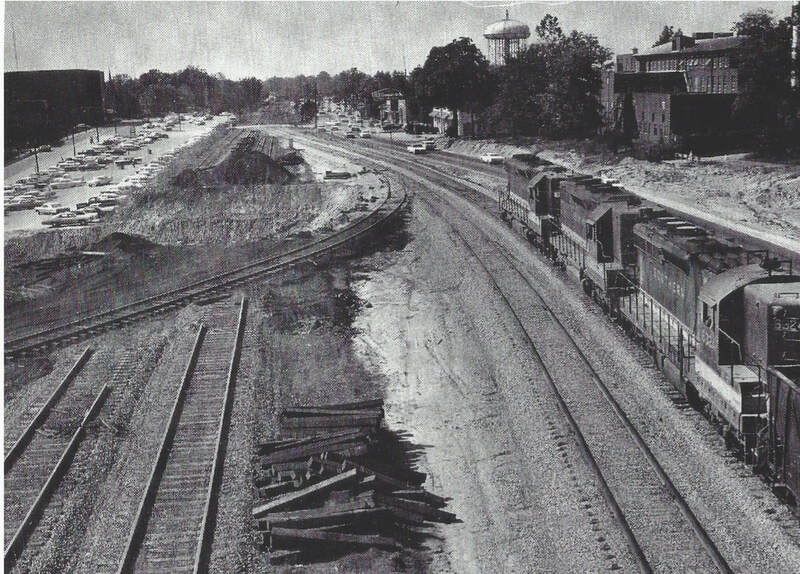 When the Winston Salem Southbound Railway was completed in 1910, a more feasible route was devised by the CG and PD RR for a railroad from High Point to High Rock connecting with the WSSB at the latter. In 1914, the line was renamed the Carolina and Yadkin River Railroad (C&YR RR) but was short lived due to financial problems. 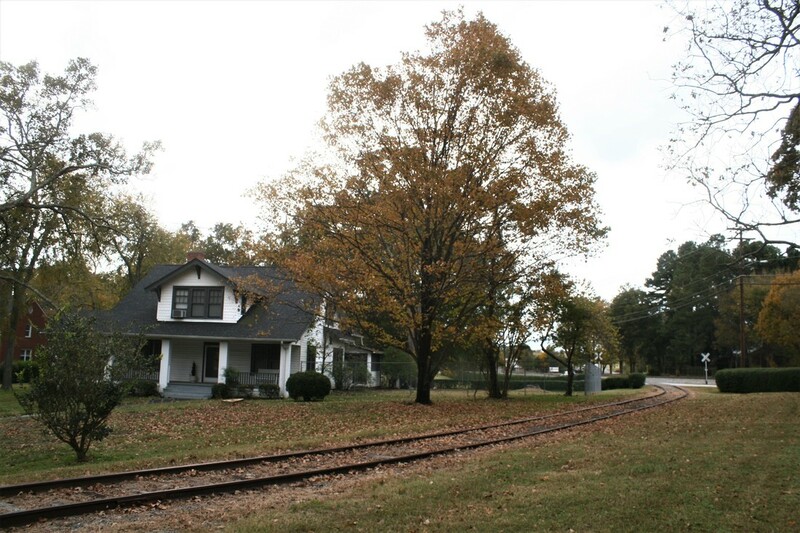 In 1923, citizens of High Point and Thomasville purchased the bankrupt road re-chartering it the High Point, Thomasville and Denton Railroad. For the duration of the 1900s, the HPT&D benefited from the thriving furniture industry in Thomasville. General freight was handled at its depot on Randolph Street in addition to other shippers such as the Glen Anna Feed Mill and Gray Concrete. But it was the presence of the Thomasville Chair Company (Thomasville Furniture Industries) that filled the coffers for decades. 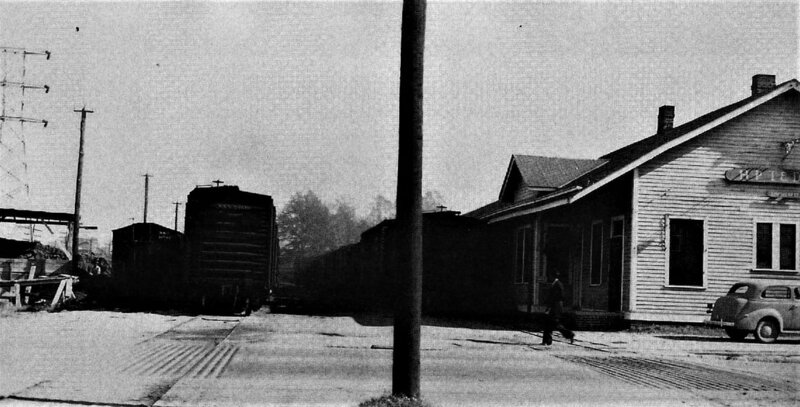 When decline onset, the first blow to the HPT&D in Thomasville was the end of operations at the depot. 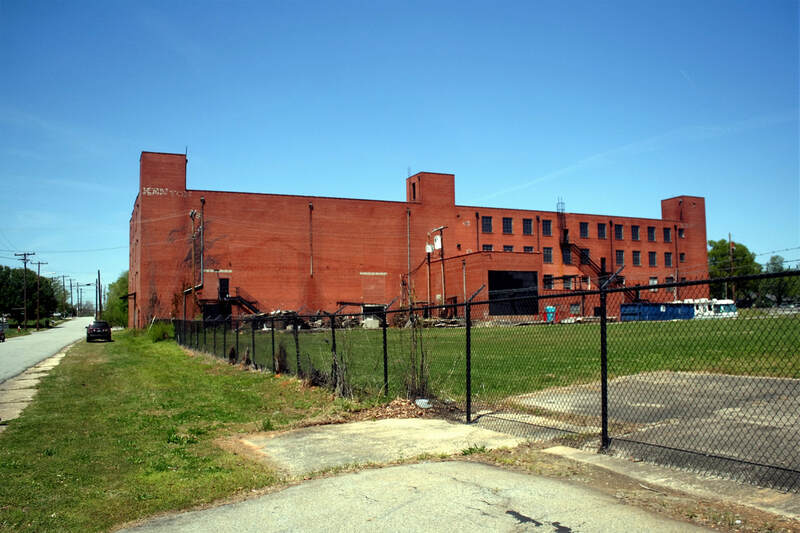 By the turn of the millennium, Thomasville Furniture Industries was in rapid descent as a domestic manufacturer and it plants subsequently closed. As a result, the HPT&D abandoned its industrial trackage to the inner region of town but its main line through Thomasville remains active. ​No doubt there are customers purchasing plants at Hill’s Farm and Garden at Randolph Street that are incognizant of the historical significance of the business structure. Serving merchants for farm and gardening needs, it fulfilled a different role as the centerpiece of the old industrial railroad district in Thomasville. 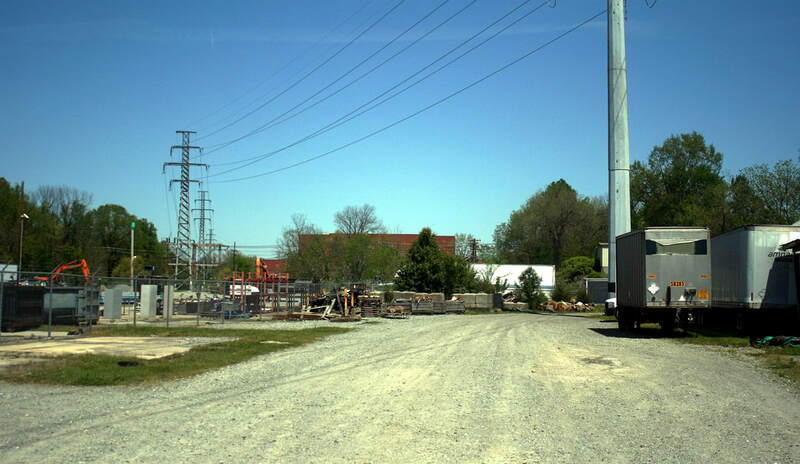 The first depot for the Carolina and Yadkin Railroad was constructed near the site of what would become Jewel Mills. With both the rapid growth and extension of the railroad this original building was abandoned in 1913 and a new structure constructed on Randolph Street in a blossoming industrial region. 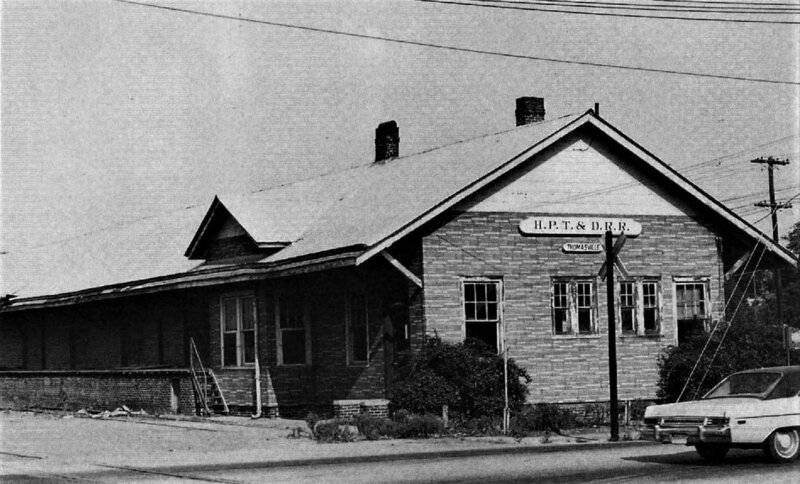 In 1924, the High Point, Thomasville and Denton Railroad had succeeded the C&YRR and within two years, the depot underwent its first expansion. Area industry continued its growth and a decade later, in 1936, the structure was again enlarged to its present day configuration. 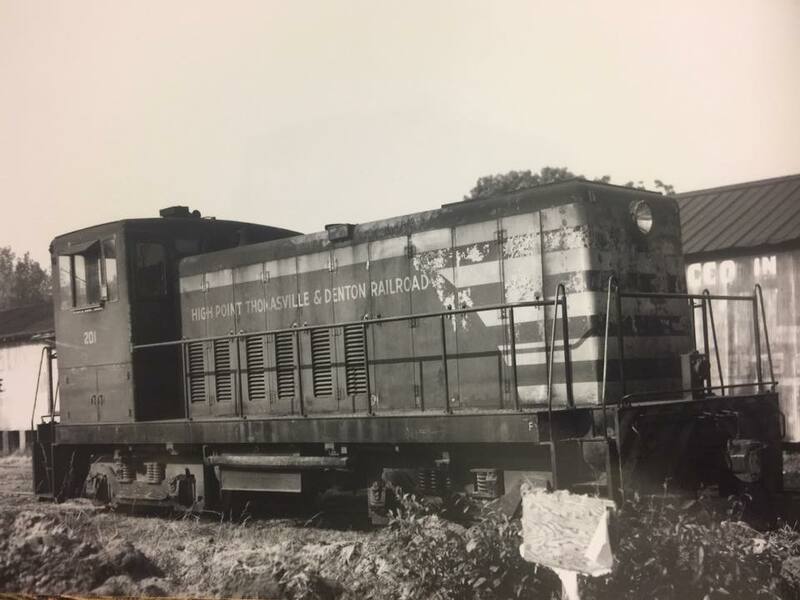 The depot continued as a beneficiary of the industrial boom in Thomasville during the post-war era and it was not until the 1960s that its importance began to wane. Decline was steady and by 1977 the HPT&D decided to close the agency and the depot. In terms of national railroad chronology, this was a late date as most small agencies had ceased by the 1960s. After its closure, the former HPT&D depot was sold and remained dormant until Hill’s Farm and Garden opened for business at the location in 1986. Google Earth view of the north end of the belt line as to include the HPT&D. The primary industries from the past are identified as well as the railroad layout as it existed. Inserted spurs are ones known to exist throughout the life of industry in the area. Significant street names are also labeled for reference from the text below. Beyond the HPT&D depot moving north, the section is classified for the purposes of this writing, the north end of the belt line loop. This sector was dominated by furniture plants and in terms of railroad layout, the most interesting track configurations especially in regards to the HPT&D. The extension of the HPT&D to the depot ran parallel with Southern Railway belt line separated generally by several hundred feet. In this area, a track connected both lines between the depot and Taylor Street. Both railroads crossed Taylor Street and Julian Avenue—past here, the belt line track turned in a northwesterly direction and the HPT&D depot extension continued straight with a connection to the main near the Carolina Avenue grade crossing. Also at this location was the HPT&D track that ran west crossing the belt line on a diamond and ending with a connection to the Southern Railway main line along East Main Street. This line also crossed the depot extension track on a diamond with connections that created a wye. North of this area, the belt line crossed Trinity and Blair Streets heading for its north end junction with the Southern Railway main line at Liberty Drive. From the trackage of both railroads in the north sector originated spurs to serve the various plants. Industries located in this region included Cramer Furniture Company, Thomasville Bedding Company, Thomasville Chair Plants C, D, E, and Jewel Mills. A later addition was the phased construction of a distribution warehouse by Thomasville Furniture Industries. At first impression, the Thomasville Chair Company Plant E appears to have been the smallest of the operations--at least ones served directly by rail. Its two buildings are tucked between North Hamby Creek and the Southern Railway belt line at Taylor Street. During the postwar period, the Thomasville Chair Company (and later Thomasville Furniture Industries) sought to improve efficiency in its distribution operations. Since each plant constructed specific furniture, it made sense to centralize the finished products at a single location for distribution. The solution was to construct a facility between Taylor Street and Julian Avenue for this purpose--apparently the construction occurred in phases as it is comprised of added structures. 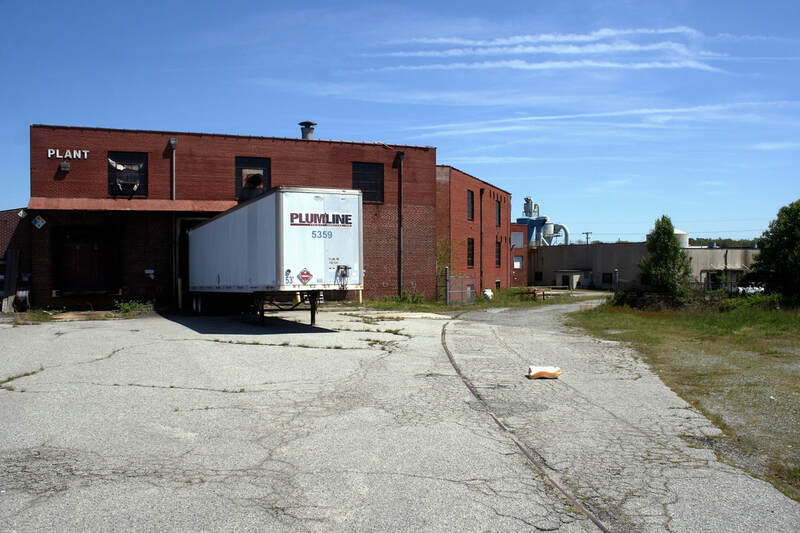 This facility was served exclusively by the HPT&D with boxcars spotted alongside its loading dock. Another shipper from the past located along the HPT&D at Taylor Street was the Thomasville Bedding Company. In spite of the dramatic changes that have transpired during the past two decades, a significant amount of infrastructure remains at the Taylor Street area. One can explore the area and still gain a sense of what was when it teemed with activity. Sadly, the people are gone as are the jobs and the parking areas once filled by employee vehicles and eighteen wheeler trucks are empty. 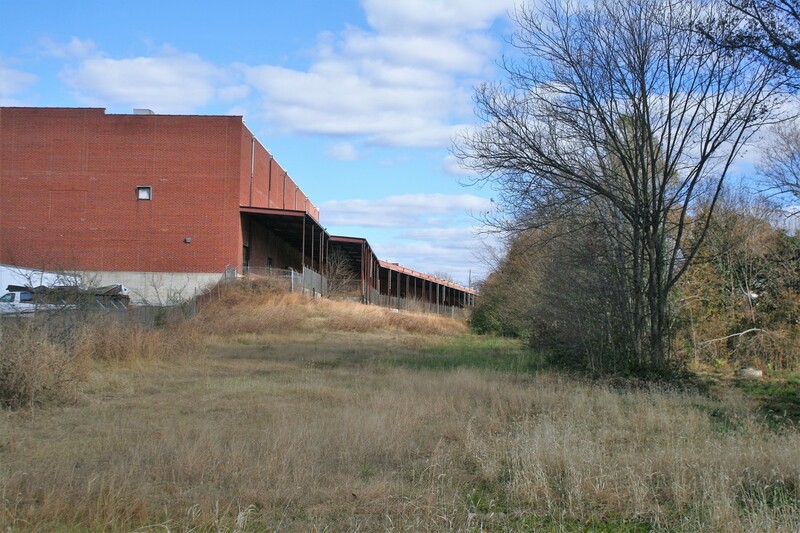 At Taylor Street, the Thomasville Chair Company Plant E building remains adjacent to the grade crossing and the view north fills the eye with the rear of the large distribution warehouse. The belt line track is still intact here and a walk south from the grade crossing will reveal the switch for the former connection track to the HPT&D. Continue a couple of hundred feet more and a short trestle is visible spanning North Hamby Creek with the track intact. In regards to the remaining former Southern Railway belt line track, this area from Taylor Street to Julian Avenue is the final vestige. North of Julian Avenue, the track is removed from that point extending to the former north end belt line connection with the main line. On the opposite side (east) of the distribution warehouse at Taylor Street, the roadbed of the HPT&D is visible as is the long loading dock of the large structure. A shipper from the distant past, the Thomasville Bedding Company, once stood at the HPT&D Taylor Street grade crossing. 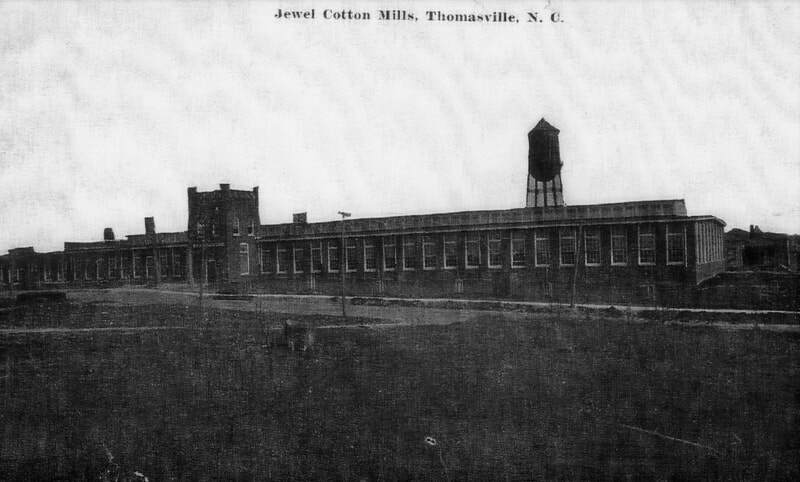 The first of the large cotton mills to emerge at Thomasville, Jewel Mills commenced operations in 1909. Architecturally, it was an ornate structure and particularly at its main façade representative of textile mill construction during the 1890-1910 time period. 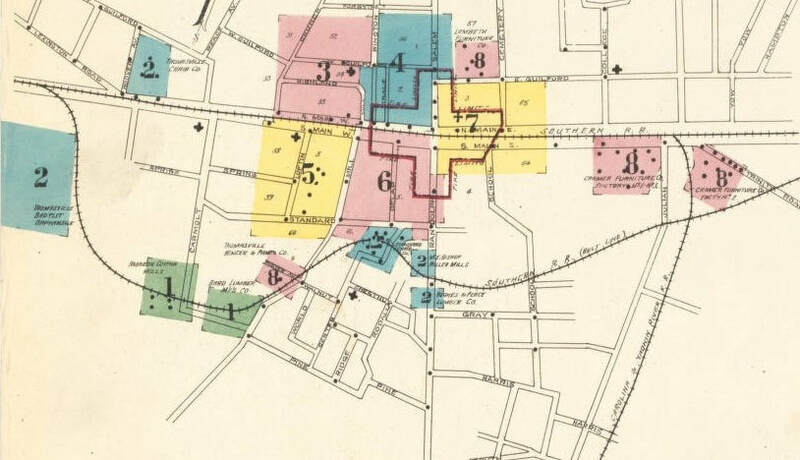 Inexplicably, the building was not depicted on early Sanborn maps therefore its early railroad layout is not represented. By judging from early maps and aerials, it appeared to have been served by the HPT&D from a spur that fish hooked around the front and possibly at the rear of the plant for coal. A long time landmark at the north end of town, it ceased production in 1970 but stood until destroyed by fire in 1980. During the first decade of the 20th century, the Cramer Furniture Company was touted as the largest wood plant in the South. Its beginning auspicious and its future deemed secure, the company experienced four expansions within that decade. It was served by both the Southern Railway and Carolina and Yadkin River Railroad which helped secure it as the premiere furniture maker during the industry infancy at Thomasville. But in 1914, the Cramer Furniture Company passed into history when it was acquired by the upstart Thomasville Chair Company. 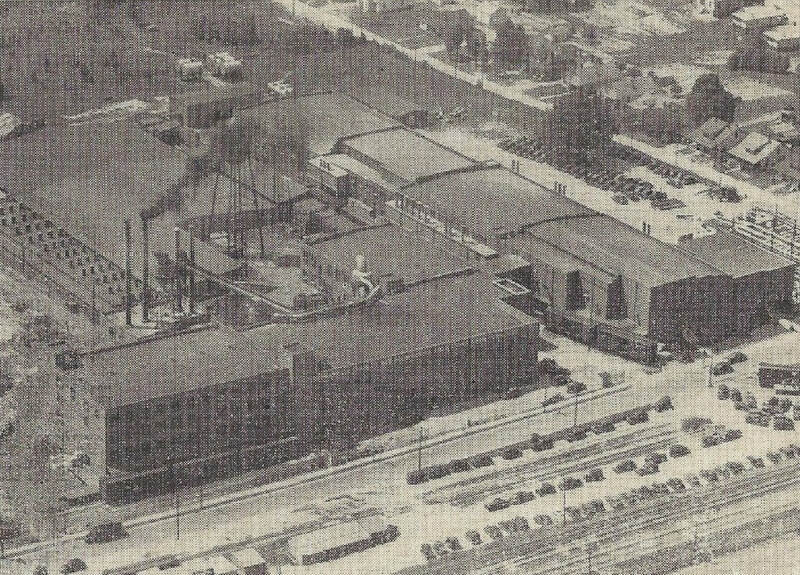 The new owner incorporated the former Cramer complex as its Plants C and D. The expansion of a furniture manufacturing empire was in the making. 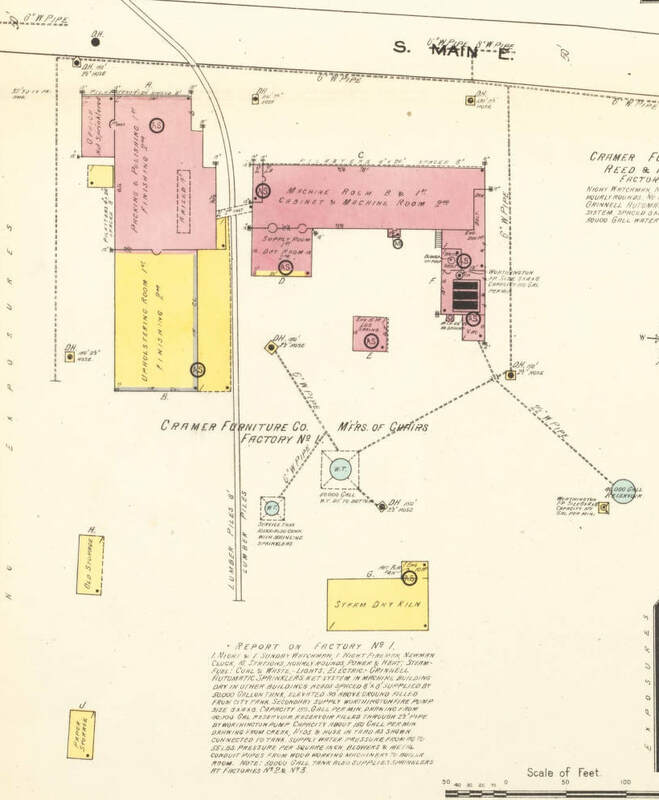 Above: 1913 Sanborn map of the Cramer Furniture Company Factory #1--it became Thomasville Chair Company Plant C the following year. It was served by a spur from the Southern Railway main line. Right: Railroad track existed on three sides of the Factory #2 (Plant D) building--the Carolina and Yadkin River Railroad/Southern Railway interchange, Southern Railway belt line spur and, curiously, a spur alongside Trinity Road depicted as originating from the belt line at this date. 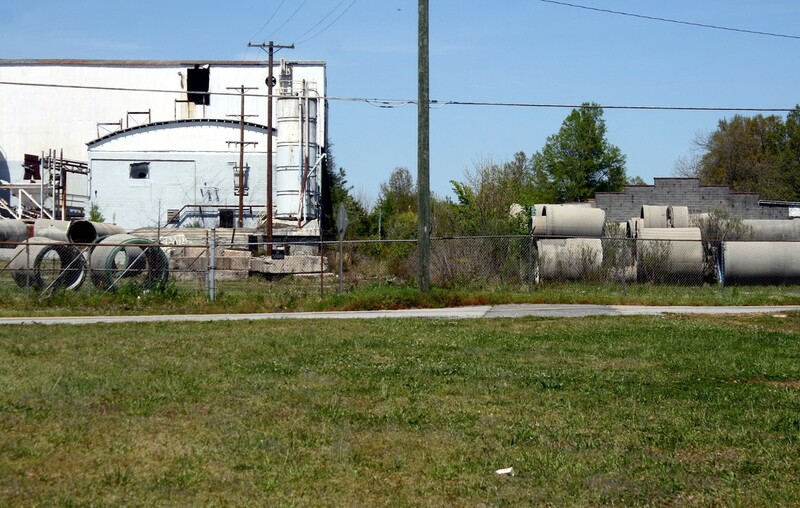 Changes throughout the passing years have altered the heart of the former railroad district bordering the former Thomasville Chair Company Plants C and D leaving few remnants. No trace of the "fish hook" spur to Plant C exists although rails of the spur from the Southern main are visible. All of the track of the Southern Railway belt line and the diamond (crossing) of the HPT&D has been removed. When the Jewel Mills building was destroyed by fire in 1980 and the lot reclaimed, undoubtedly the spur there was removed at that time. 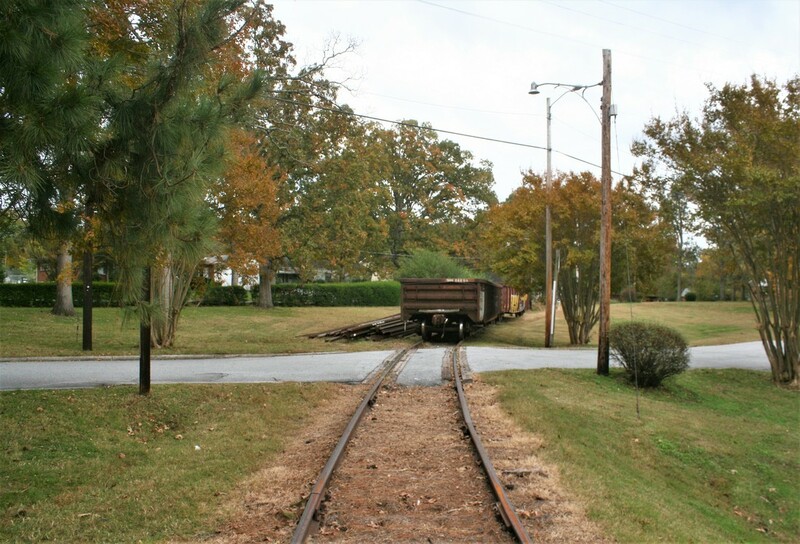 The original HPT&D main line from Thomasville to Denton--the connection track to the Southern Railway main--is removed between the active HPT&D to the rear of the former Plant D. In fact a business, Carolina Custom Furniture, is constructed upon its former right of way. There exists a bit of mystery concerning the spur to the Thomasville Chair Company Plant D spur on two counts. On the 1913 Sanborn map above, the track is recorded as dead ending at the intersection which meant it could have only been a belt line connection. But other early maps and drawings show as it actually exists-originating off the HPT&D/ Southern main connection. Also, the spur could be served by either road but in the final years of Plant D operation, the only possible way was from the Southern main---the HPT&D/Southern main connection had been abandoned. Quite a history regarding one industrial spur. A transformation that occurred in the north end of Thomasville was the Julian Avenue road project (National Highway) that began during the late 1960s. The road was expanded to four lanes and resulted in change to the railroads at specific locations. An underpass was constructed at the Southern Railway main line and the Julian Avenue bridge that spanned the HPT&D was removed resulting in the railroad crossing the road at grade. At the extreme north end of the former Southern Railway belt line, the exploration of the past becomes anticlimactic in the sense that little remains. All of the track in this area is gone but the right of way is easily traced in specific locations. 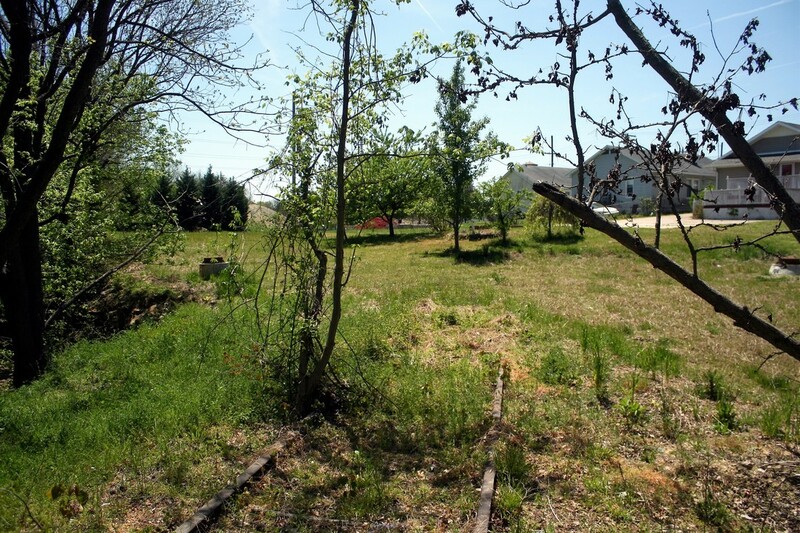 Asphalt patches mark the former grade crossings of Blair and Trinity Streets and clearings through stands of wooded areas define the right of way. Adding to the difficulty of exploring the area are the fenced lots where the railroad passed which restricted access or that would involve trespass. No trace remains of the north end belt line connection to the main line at Liberty Street. Two shippers that located along the railroad between Trinity and Blair Streets were the Gray Concrete and Pipe Company and the Colonial Manufacturing Company. 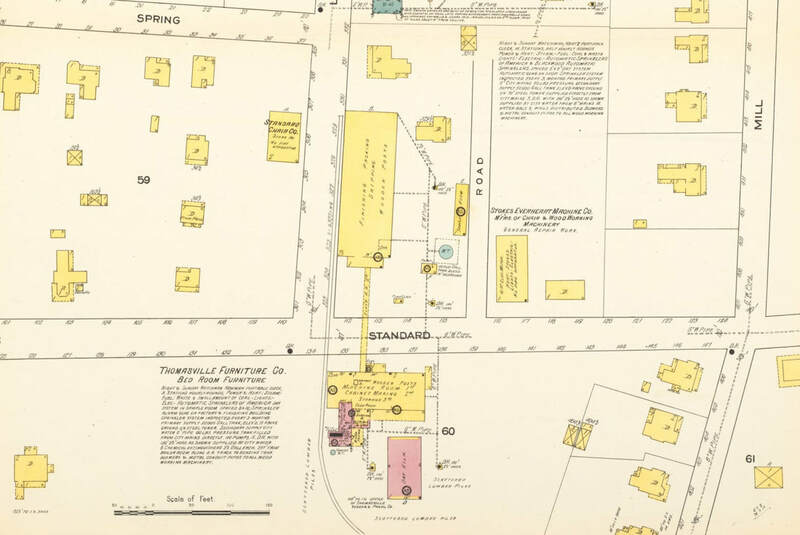 Neither business is indicated on the 1941 Thomasville map above which suggests both emerged on the scene in the post war period. Gray Concrete was an expansion of its presence on Randolph Street (this property is also owned by Rinker Material Hydro Conduit) and this facility last received rail service during the late 1990s. The Colonial Manufacturing Company was a small specialty furniture maker that utilized rail service during its existence. Moving to the southeast at Carolina Avenue and the HPT&D main line, all of the connecting track including the extension to Randolph Street is gone. The right of way is apparent where the connecting tracks formed a wye and a diamond crossing but that is the extent. All of the HPT&D industrial track was removed circa 2004-2005 and only the main line remains. The sharp curve on the main here marks the beginning of the early 20th century extension of the railroad from Thomasville to High Point . For the railroad modeler enticed with industrial switching, the Thomasville belt line and HPT&D presents the opportunity in a compact area to replicate. Many of its elements could be included on a layout or free lanced to represent what existed. Such a layout could be constructed as a stand alone switching theme or incorporated on a broader scope to include the Southern Railway and/or HPT&D main lines. Given the small area of the prototype, the track of both the belt line and HPT&D could be realistically modeled in its entirety. To model the area at or near its prime, the time period 1920-1965 would be the historical window to consider. Virtually all of the shippers concurrently existed during this era maximizing the modeling potential. Motive power would include the steam era into second generation diesels offering considerable variety. As for freight cars, boxcars---plenty of them. Of course there would also be hoppers of coal plus flatcars and gondolas for various uses also. Scenically, the terrain is relatively flat but North Hamby Creek could be added creating some relief there and also for the small trestles. Specific landmarks to include would be a small representation of the right of way (and coal spur) through the Thomasville Baptist Orphanage, Hinkle Milling, and the HPT&D depot. The large furniture factories and cotton mills would suffice with general industrial buildings unless one wished to scratchbuild any of them. Researching history is as equally rewarding as it is frustrating. In compiling this effort, it was pleasantly surprising to discover information about specific locations along the Southern Railway belt line; conversely, it was disappointing to realize other aspects had not been as thoroughly documented. 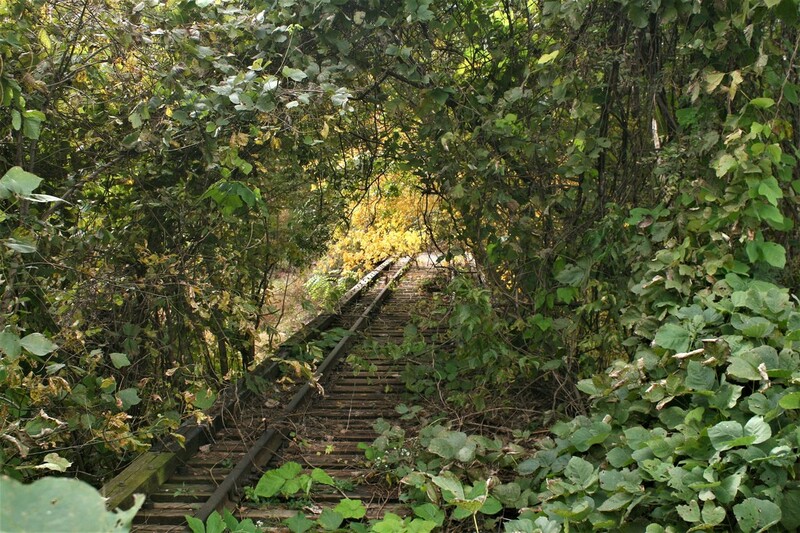 Without question, the lack of photos---at least in the public domain--- for either the HPT&D on its now abandoned trackage or of trains on the Southern Railway belt line from any era is the deepest regret. They are sure to exist but likely in private collections. If any are obtained at a future date, they will be inserted into this piece. Finally, industrial history is complex as a general rule and facts in that regard are often not exact or listed in error. There exists the possibility that could be applicable to information stated on this page and if a reader discovers errors and /or omissions, any corrections are welcomed.